The Sixes football team had come through a few tight matches to gain a place in the final, but really showed their class in tonight’s game! The game began with chances and half chances at both ends, but a few good stops by Hugo ensured the team did not concede a goal early on. After 10 minutes of the first half had been played, Bradley put the team in front when he prodded the ball in from just in front of goal! Not long after, Flynn nodded in a second from a corner, then scored again with a powerful long shot which zipped in past the goalie! The team went 4-0 up when the ball went in off Ethan G’s back! ‘That was a jammy goal, but I’ll take it,’ he was heard saying as the team congratulated him! More space opened up in the second half as Outwoods tried to get back into the game. However, buoyed by their lead, the Sixes pushed forward to repeatedly get behind the Outwoods’ defence, resulting in two more goals from darting runs by Ethan G! Bradley put the team 7-0 in front with a fine shot, then Flynn calmly directed another corner into the net with his head! Dylan wrapped up the game and an excellent performance by the whole team with a poacher’s goal, making the final score 9-0! Despite the scoreline, Outwoods are a good team, but unfortunately faced the Sixes at the top of their game today. 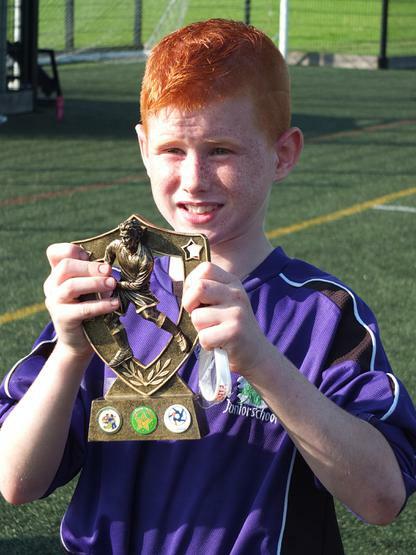 Bradley bossed the midfield, denying them opportunities to build up attacks, and the number and range of scoring options in the Edge Hill team meant the Outwoods’ net was always under threat! Edge Hill Sixes: Bradley, Ethan I, Calum, Hugo, Kacper, Ethan G, Flynn and Dylan! Three teams from Y5 represented Edge Hill in this final competition of the year! Edge Hill A: Harry, Spencer, Lucas, Nicola, Jake W, Jack D, Lewis, Phoebe and Mith! Edge Hill B: Katie, Conner, Elloise, Elsie, Courtney, Amber and Abigail! Edge Hill C: Isobel, Josh A, Adam, Roman, Theo, Josh J, Jack W and Jake W! 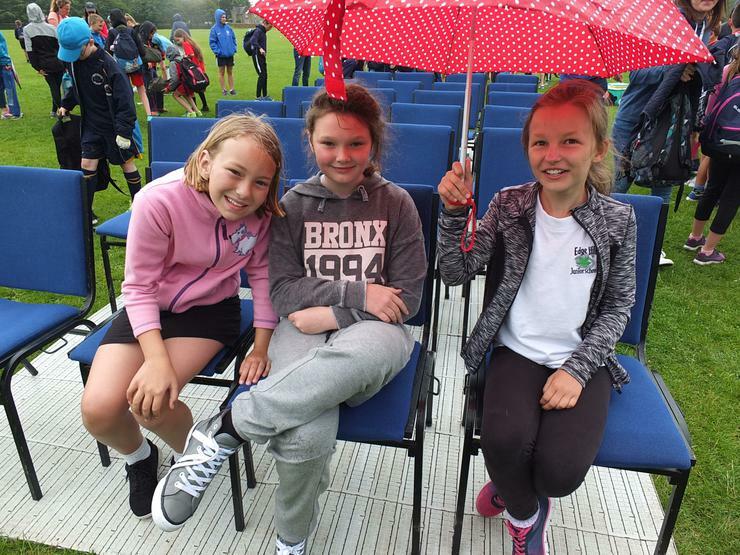 After wet weather had caused the cancellation of several sports fixtures over the past few weeks, the skies cleared for our school sports day! 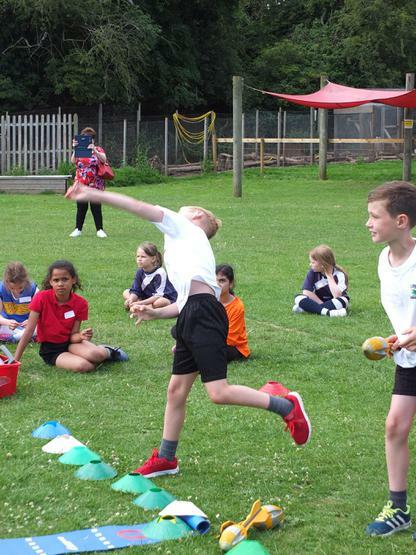 Athletes from Y3-Y6 competed in their houses in track and field events that included sprints, skipping, sack and obstacle races, relays, mini-marathons, shot putt, discuss, javelin and long jump! 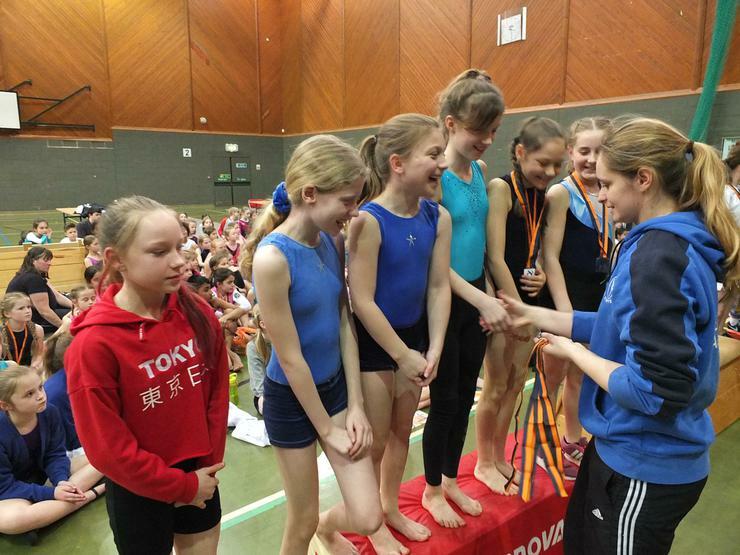 Almost every child competed in one event or another with some fine individual performances on show. Every competitor got a cheer and a round of applause for finishing his or her event. 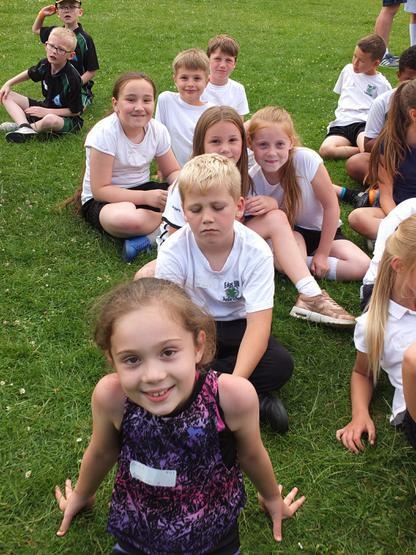 It was fantastic to see the children and parents giving so much support and encouragement to each competitor, no matter where they finished in their event! 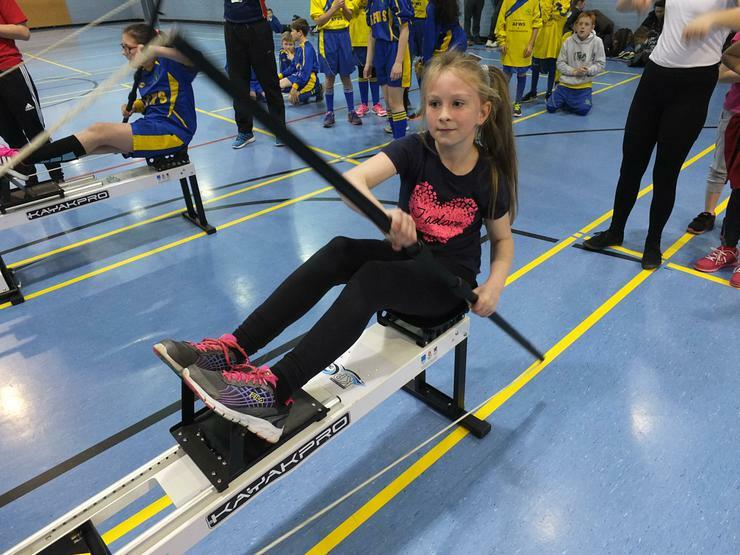 There was no shortage of interest from the children in Y4, which provided all the athletes for the three Edge Hill teams who took part in this competition. Also, it was great to see many interschool competition first-timers volunteering to fill up the 4 girl and 4 boy spaces in each team! 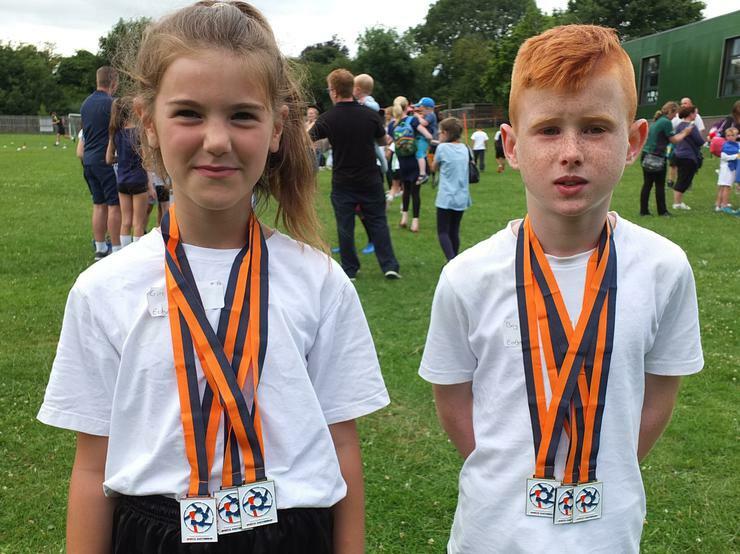 Each athlete took part in 4 events: 50m sprint, 400m, standing long jump and howler throw, with their times and distances converted into points and added to their team’s total. There were some excellent individual performances from the Edge Hill athletes who received medals for finishing in 1st, 2nd or 3rd place. Girls’ Howler Throw: Alivia – Gold! 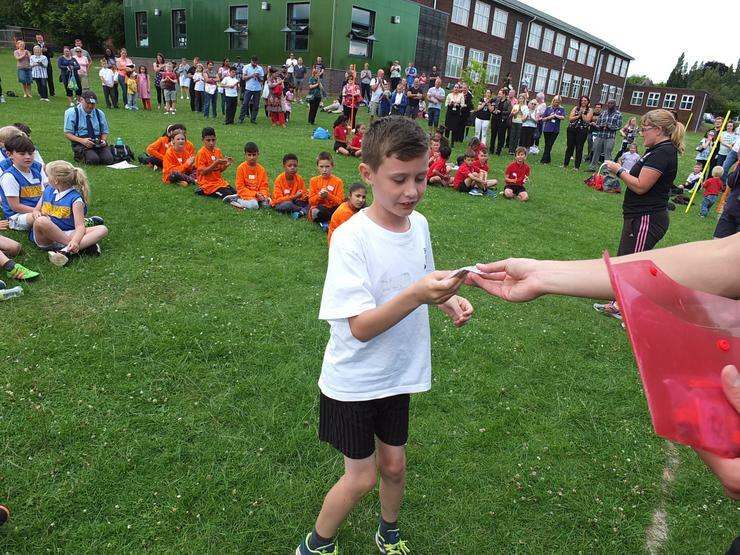 Boys’ Howler Throw: Kian – Gold! (massive +29m throw) Harrison – Silver! 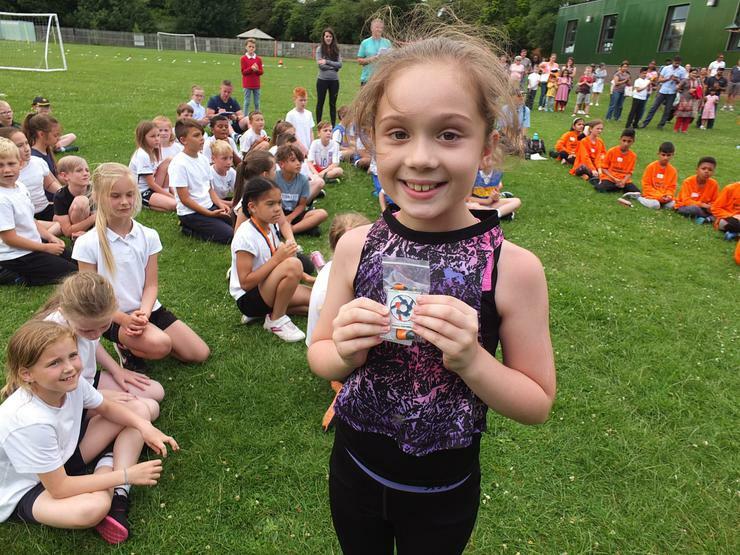 Girls’ Long Jump: Fearne – Silver! Scarlett – Bronze! Boys’ Long Jump: Harrison – Gold! 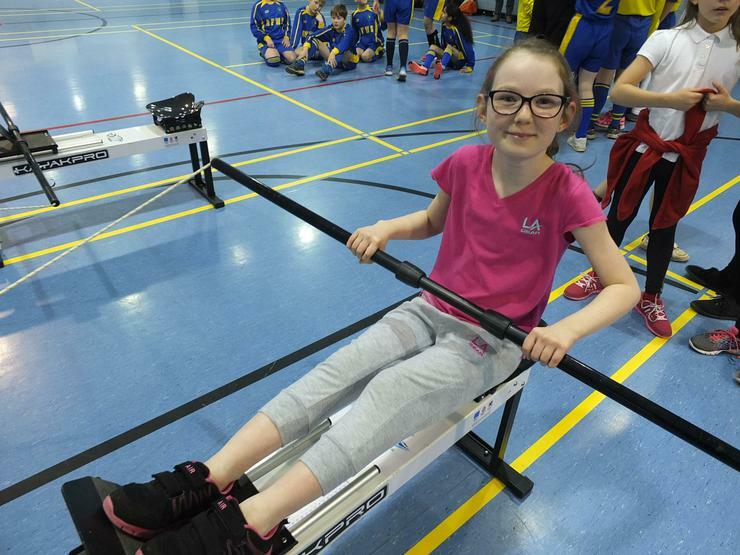 Girls' Sprint: Scarlett - Gold! 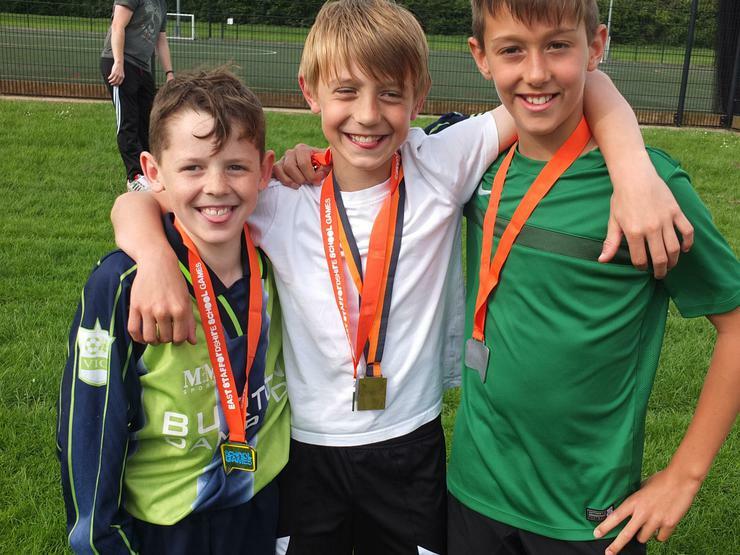 Boys’ Sprint: Charlie – Bronze! 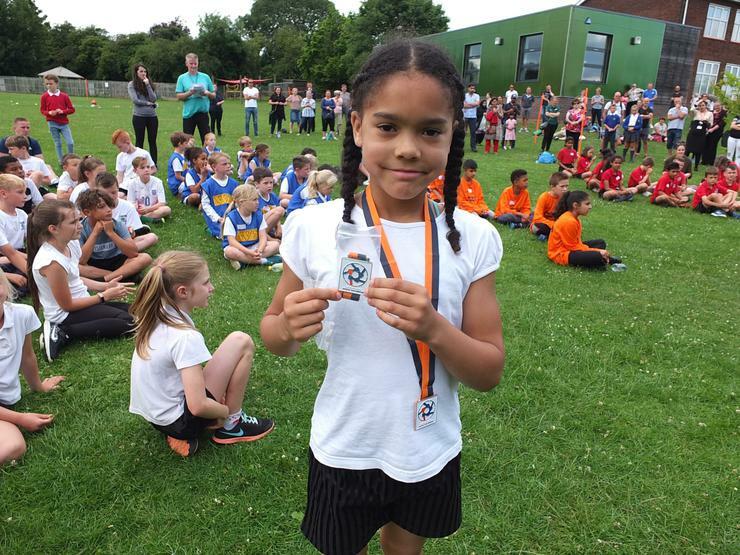 Girls’ 400m: Scarlett – Silver! Fearne – Bronze! Boys’ 400m: Harrison – Gold! Edge Hill 1 won the team event with a total of 1540 points, over 100 points clear of the second placed team! Harrison was the overall top scoring boy with 237 points, with Kian in third place just 17 points behind him. Scarlett and Fearne also filled two of the top scoring places for the girls by finishing in second and third places! A brilliant result by the Edge Hill athletes! A huge Well Done to all the teams! Edge Hill 1: Scarlett, Skye, Fearne, Izzy, Harrison, Kian, Jack S and Charlie! Edge Hill 2: Kaci, Millie, Caitlyn S, Lydia, Jack Sh, Harry, Leo and Omarion! Edge Hill 3: Alivia, Skylla, Minnie, Caitlyn R, Coby, Ty, Oliver and Dylan! Over 40 children from Edge Hill made the journey to Keele to represent East Staffs in today’s School Games Finals! 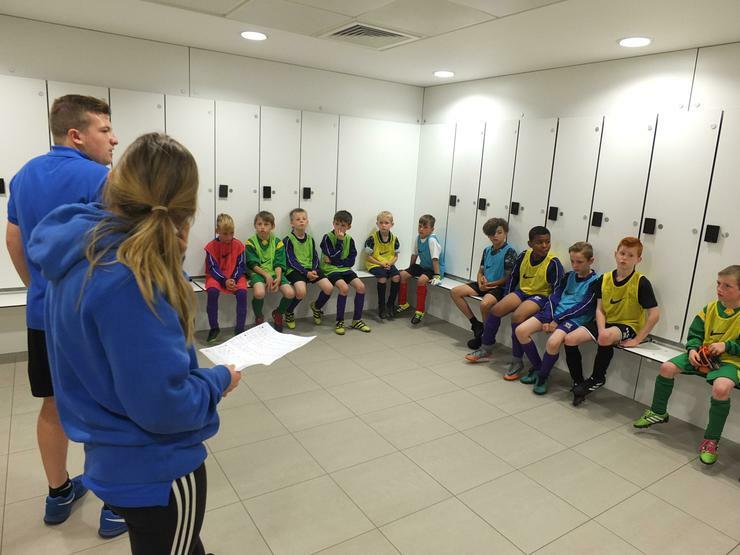 Eight teams from Edge Hill from across four different sports had qualified this year! 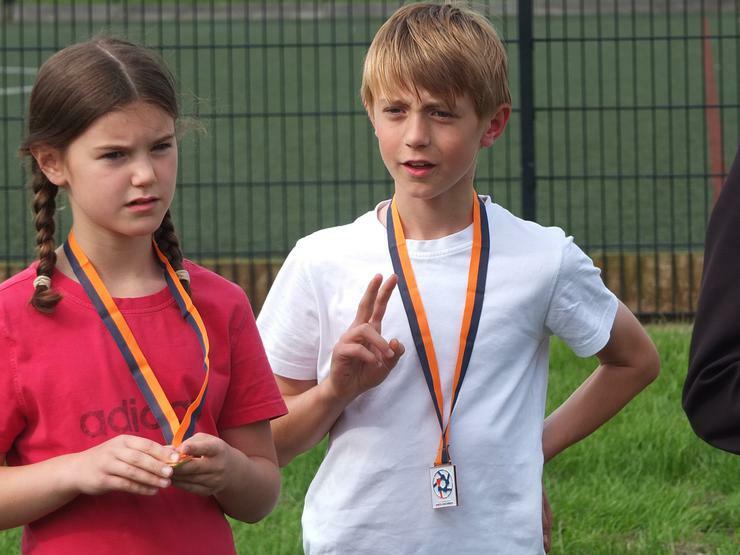 Our five cross country teams all ran brilliantly in races of up to 80 runners for each boy and girl age group. 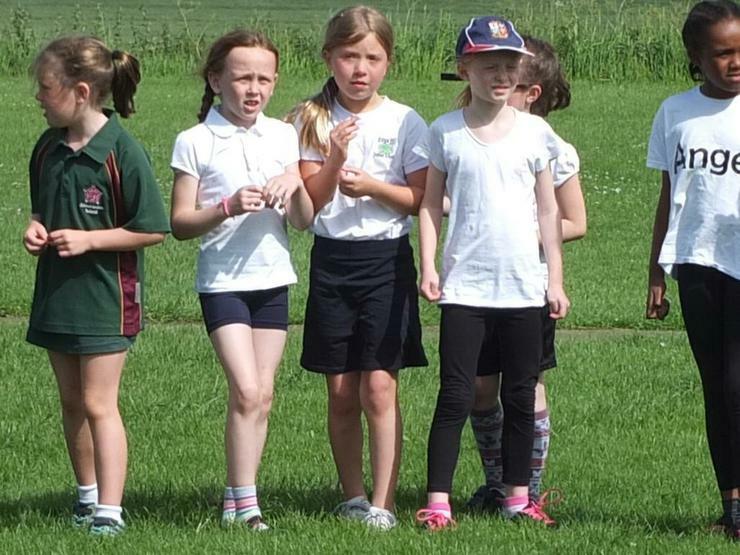 Scarlett was probably our best placed runner after finishing high in the placings for the Y4 girls. Well done to all the other runners from Edge Hill who tried their best in what is always a tough event! The boccia team from 5HN won some of their matches but didn’t quite manage to get in the top three. Even so, they did really well against some experienced teams! 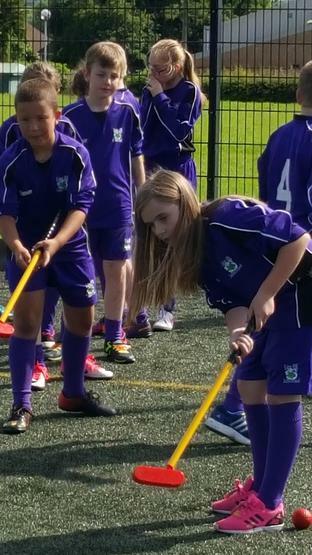 The Y5 Tri-Golfers worked hard as a team to get their scores as high as possible. They didn’t manage to get a top three spot but got better and better as the competition progressed. Samuel looks like he will make a fine golfer one day! Our biggest success of the day was reaching the semi-finals of the Y3/4 tag rugby competition. Tries by Harrison, Dru, Kian and Mia helped to get the team through the group stages. The team was unlucky to go out in the semi-final after losing just 2-3 to a very good team. All of the players can hold their heads high after showing they are one of the best young tag rugby teams in the county! Finally, a huge Well Done to all the 43 athletes from Edge Hill who took part in the finals today. Every one of them tried his or her best and was brilliant! This turned out to be a tough match against Holy Rosary who twice took the lead and at one point looked to be the likely winner of the game. It took a lot of effort to turn the score line around, firstly with an equalising penalty after being 0-1 down. After Holy Rosary went 1-2 up in the second half, the team had to raise their game to get another equaliser, which Flynn nodded home from just in front of goal. Finally, a long clearance found Ethan behind the Holy Rosary defence, and he just managed to get a toe on the ball to steer it between the goalie’s legs! It was a close game, as they often are at this stage of the season! Well done team for getting through to the final! This unique event stirred quite a bit of interest at Edge Hill, so we entered three teams of children from Y4, Y5 and Y6. Altogether, 22 teams took part in the competition. The Edge Hill teams played two games each against teams from other schools. Two of our teams, Edge Hill 1 and Edge Hill 2, won both of their matches and progressed into the quarter-final knock-out stages. Edge Hill 2 didn’t manage to progress any further, but played really well with lots of enjoyment and determination! Edge Hill 1, however, won their match and gained a semi-final place. At this stage, the best teams were starting to show their colours. Unfortunately, Edge Hill 1 met one of these teams in their semi-final and were knocked out. Even so, they did brilliantly to get so far and do so well in what was a completely new sport to them! 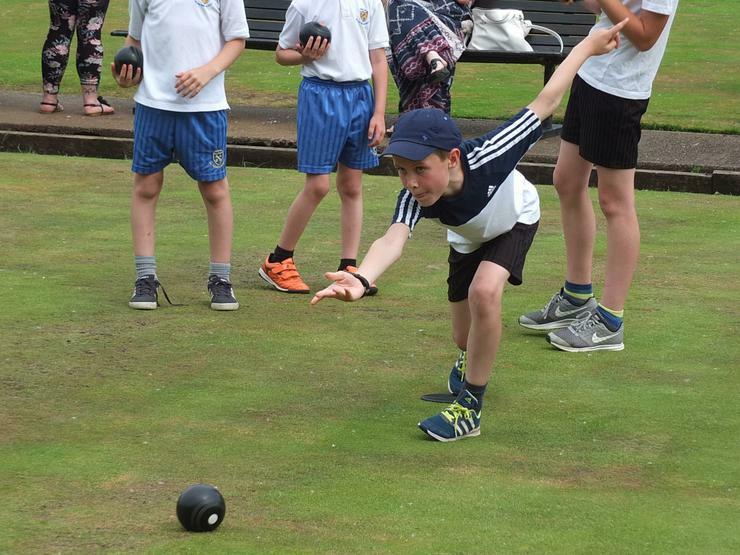 All of our young bowlers deserve a huge Well Done for trying so hard! Edge Hill 1: Danny, Charlie, Mith and Luke! Edge Hill 2: Abbie, Maya, Seren and Leah! Edge Hill 3: Lily, Sophie, Fearne and Francesca! Three teams from Edge Hill took part in this tournament today. They all played really well and one of the teams won the competition! Edge Hill A qualified for the semi-finals as best group runners-up, having drawn two and won two of their group matches. Included in the team’s results was a 9-0 victory over Moseley which bumped up their goal difference no end! They met Anglesey in the semi-final and did brilliantly to win 2-0! A close final against Victoria saw normal time end in a 4-4 draw, but the team put two goals in the net to win the match in extra time! Edge Hill B were very unlucky not to get through to the semi-finals after staying unbeaten in their group. In fact, Edge Hill A pushed them out of qualification on goal difference! Unlucky, team, you played really well! Edge Hill C had a tough time in their group but tried really hard. Well done to the team for competing right to the end! 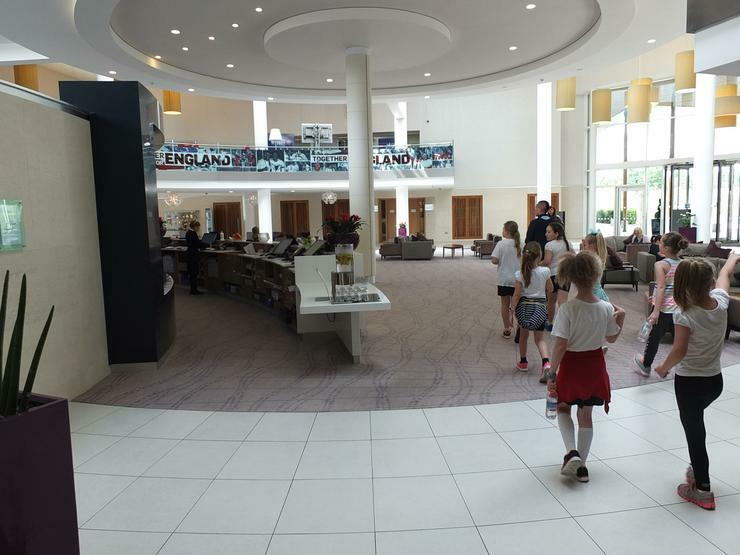 Two groups of children from Y3 and Y4 visited St George’s Park for a guided tour, followed by coaching sessions led by Sports Coaching students from Burton College. 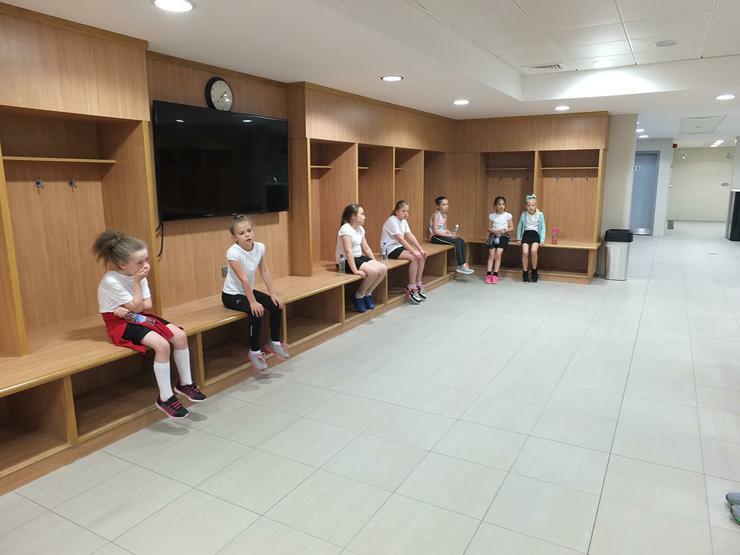 Each group was treated to a tour of the impressive facilities at St George’s, even visiting the England changing room! 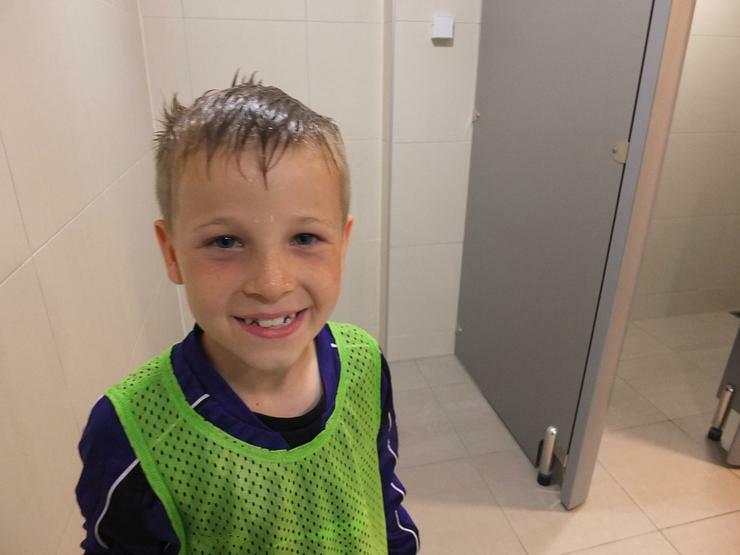 Cole got a bit of a shock when he stepped into examine a shower cubicle and got a soaking when the shower automatically came on! Wonder if that ever happened to Wayne Rooney or Harry Kane? 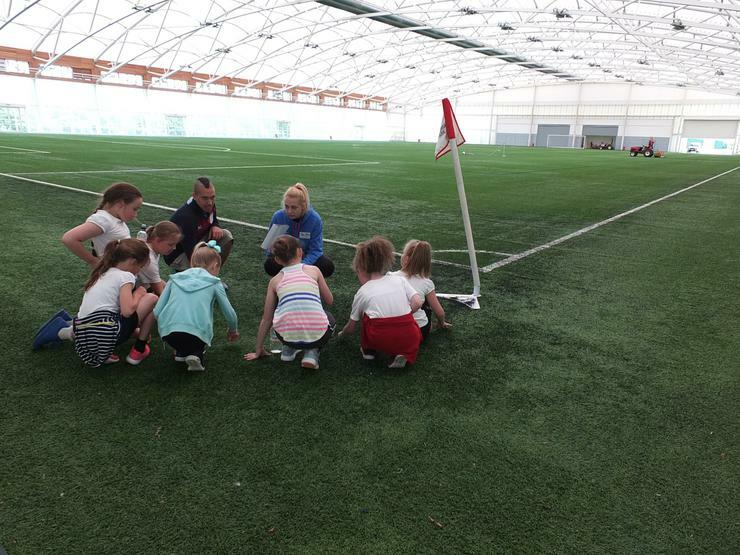 Also, they were bombarded with facts about the billions of bits of shredded tyres that are sprinkled over the indoor 3G pitch, and the percentage of rye grass on the full-sized Wembley replica pitch! 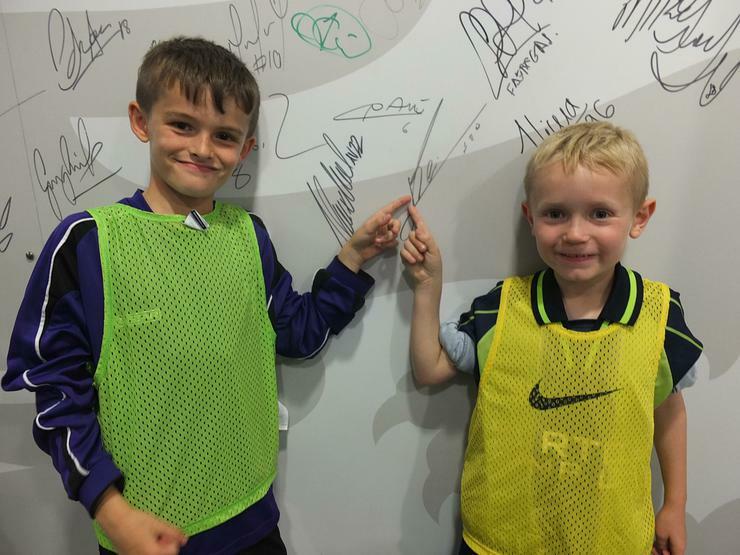 Afterwards, the children found Lionel Messi’s signature on the autograph wall, along with many other top players who had visited St George’s. 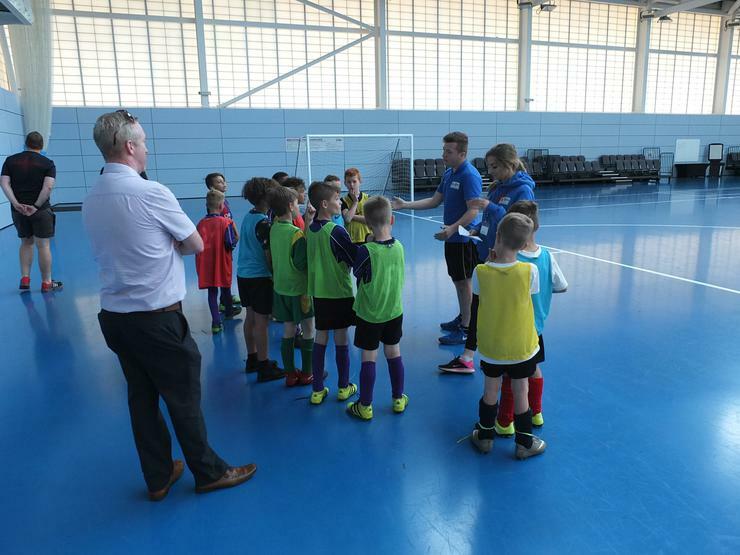 After the tours, the children took part in coaching sessions and matches all led and refereed by the students. Everyone had a great time and will always remember the experience. Many thanks to all the students from Burton College for a great few days! 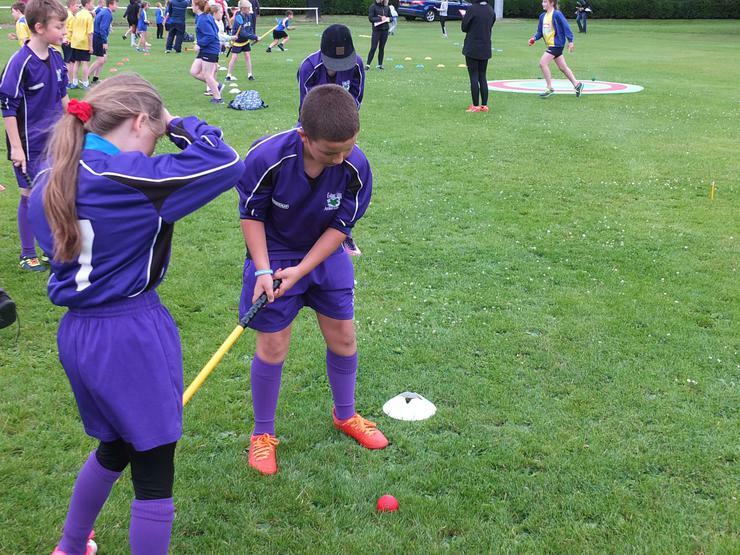 Having recently introduced Tri-Golf into our PE curriculum, we were keen to take part in this competition. 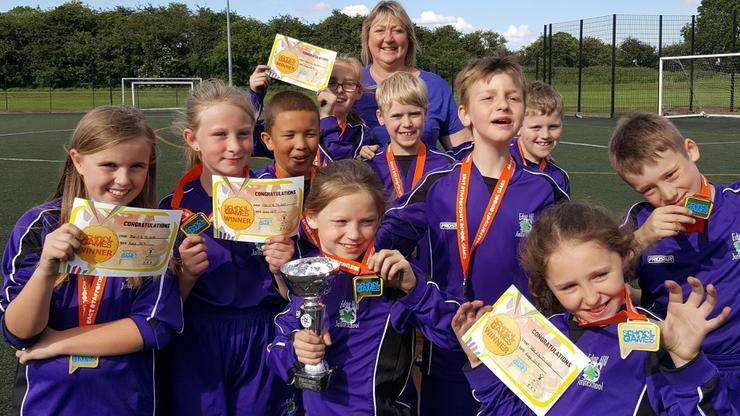 As well as being an alternative, fun sport to complement the more traditional sports we take part in, Tri-Golf is an inclusive activity that suits children of all ages and abilities. 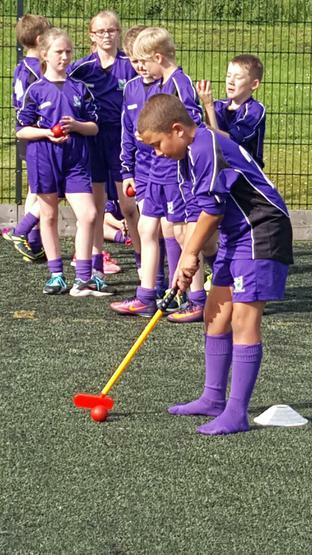 A team from Y5 represented Edge Hill in this qualifier for the Tri-Golf Staffordshire County Finals. The teams carouselled around a range of activities that tested their accuracy and skill at putting and chipping. Our young golfers worked together by helping each other with advice. Once all the activities had been completed and the points totted up, the team was genuinely delighted to hear they had won! Sophie, in particular, was very excited about taking part and absolutely chuffed about winning! Sophie, Katie, Phoebe. Lewis, Joshua A, George, Samuel, Lacey, Joshua J and Abigail! 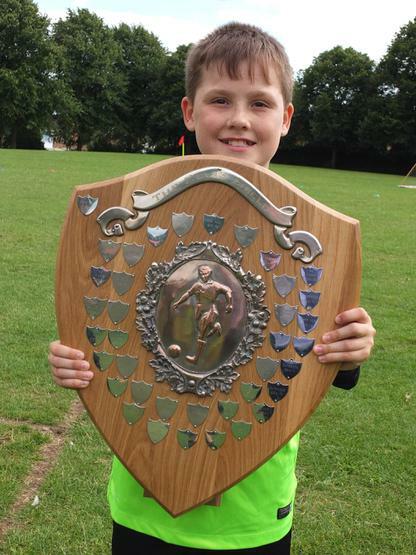 The Edge Hill Sixes team played Kingfisher Academy in the second match of the Ellis Shield knock-out competition. With a few regular players unavailable, Calum stepped in again to bring the team up to strength. Once again, he slotted into the team with no problem whatsoever – and even got on the score sheet with a great goal! Kingfisher were a lively team but the Sixes were very active at nicking the ball, denying them any length of time in possession. Once the ball was in Edge Hill’s possession, the team swept forward into scoring positions and by the end of half-time, the Sixes had scored 5 goals. In the second half, Bradley played in goal (albeit rarely in his area a la Fabian Barthez) and did his part in keeping the action at the other end. 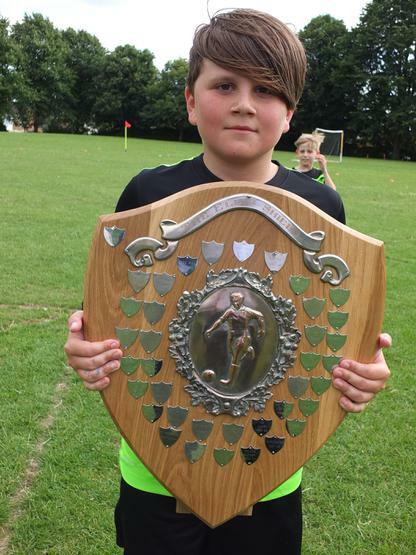 As a result, Ollie was able to push forward to net a hat trick, contributing to the 6 second half goals scored by the team before the final whistle blew! Huge congratulations to the team for putting on a commanding performance, and for getting into the next round! Once again, more than 50 Edge Hill children from Y3-Y6 put themselves forward for this event. It’s fantastic to see so many wanting to take part in this individual and team challenge! Medals were awarded for both individuals and teams for each event. The first three finishers from each school decided who would win the team event. Winning a team event also won the school a trophy and a place in the county finals! 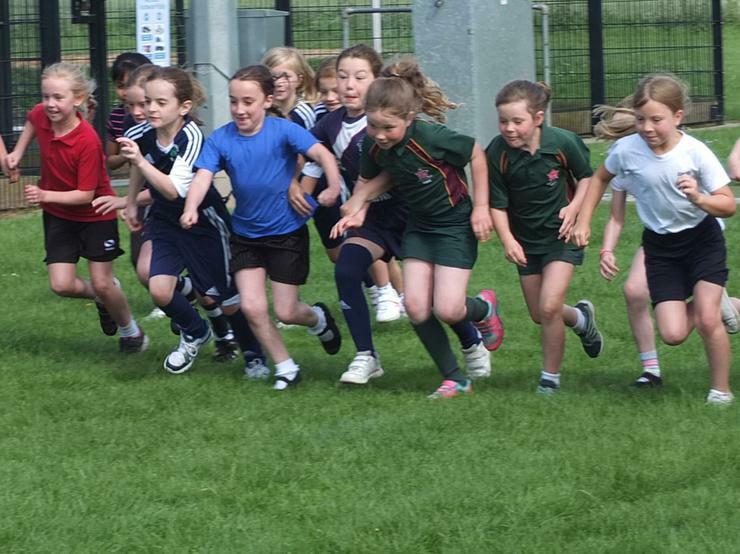 Y3 Girls: The races began with a great performance by our young runners who finished in 3rd, 4th and 5th places. Ellie won a medal for 3rd place and the girls won the team event and a place in the county finals! Also, great runs from Chloe and Izzy. What a start! Y3 Boys: The boys tried their best but were just out of the medals. They gave it their all though! Well done to them all for trying so hard! 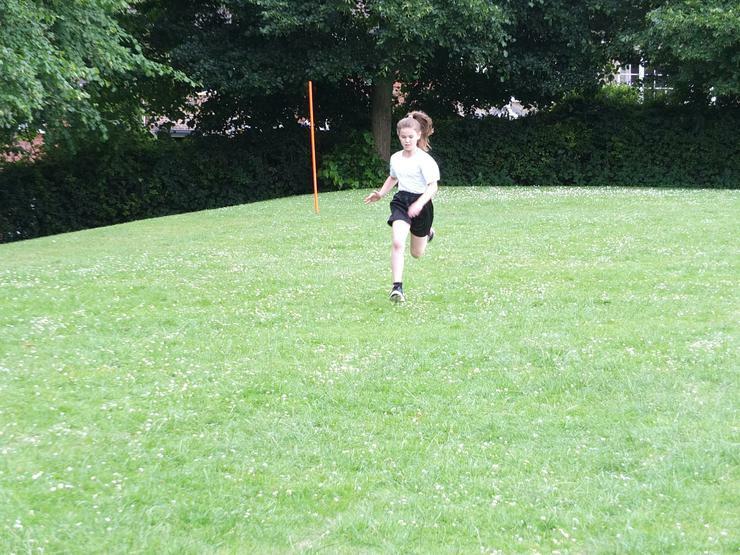 Y4 Girls: An amazing sprint finish from 3rd or 4th position saw Scarlett zip past the other competitors to win the race, just like a human rocket! After leading early on, Fearne hung on for 3rd place and Skye finished in a high position, too. The girls won the team event and we had another place at the county finals! 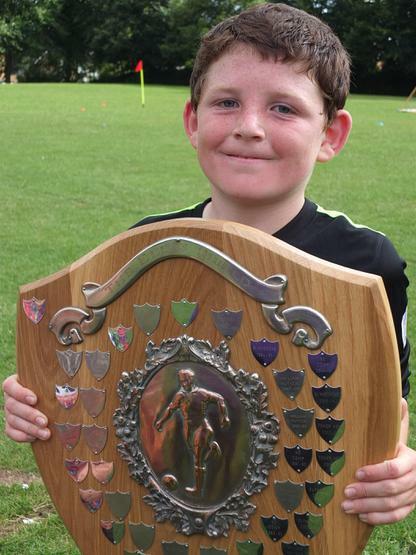 Y4 Boys: Harrison was untouchable in front from start to finish and finished way ahead in 1st place! With Kian finishing in 3rd and Jack also in the top ten, the boys won the team event, too! Another team in the county finals! 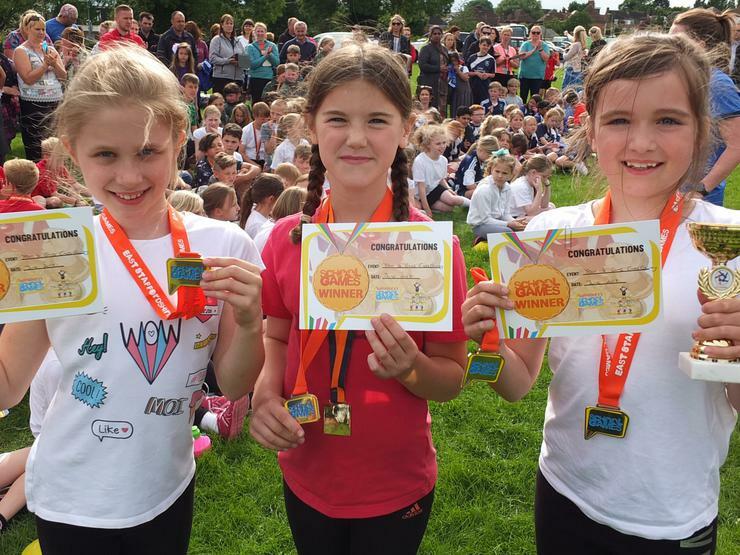 Y5 Girls: The girls ran their hearts out but just missed out on the medals. Ava led the race early on but was swallowed up by the other runners in the second half of the race. An excellent performance, though! Y5 Boys: Spencer finished in 2nd place with both Jakes gaining places in the top half of the finishing order. Other mentions should go to Elliot, Sammy, Conner, Theo and Joe, who didn’t find it easy but finished the race in style! The boys finished 2nd in the team event and won us another county finals place! Y6 Girls: Erin was always near the front and did brilliantly to finish in 3rd place. Grace pushed herself really hard to finish the race in what was a real gutsy performance! Y6 Boys: Only three Edge Hill Y6 boys took part in this final race and they did brilliantly to finish 2nd in the team event! Well done for winning another place at the county finals for Edge Hill! Finally, a huge Well Done to all the runners that took part from Edge Hill, no matter what position they finished their race in. Each and every runner pushed themselves to complete the distance they were set and did themselves proud! After doing really well in their first tournament a few weeks ago, the team was keen to go one better today by winning a place in next month’s county finals! Some unstoppable running by Harrison and Kian paved the way for the team’s first win of the evening. 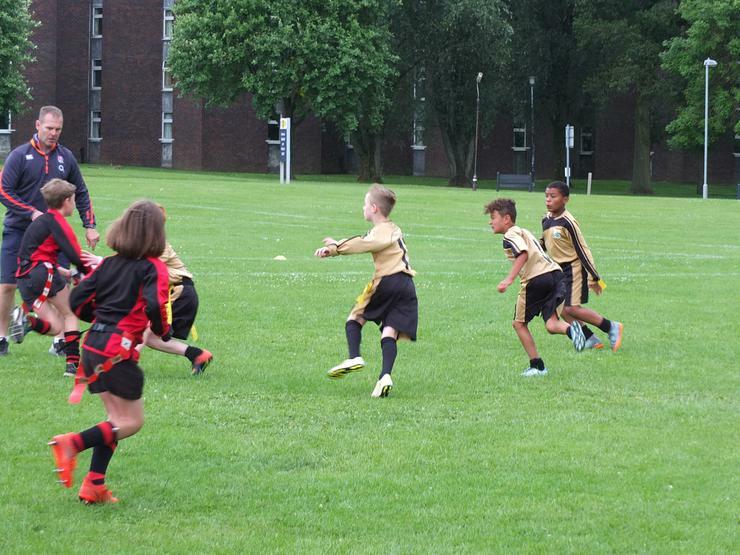 Jack also got on the score sheet, and Fearne showed her fearsome pace with a great try! The team’s toughest test was against Picknalls, the team which had pipped us to first place in a tournament a few weeks ago. However, Edge Hill pressed them constantly when they were in possession of the ball, making tackle after tackle. Picknalls kept the ball well and kept the score even for the majority of the match, but when Edge Hill won the ball back our players cut through their defence to put us in the lead again. At times it was very close, but the team fully deserved to come out on top! Another great performance saw the team quickly go 3-0 up in this match against William Shrewsbury. The opposition mounted a fightback, but the excellent running of the Edge Hill players matched them try for try! Harrison, Mia, Omarion, Jack, Fearne, Kian, Jack S, Lily, Dru and Tyrun! 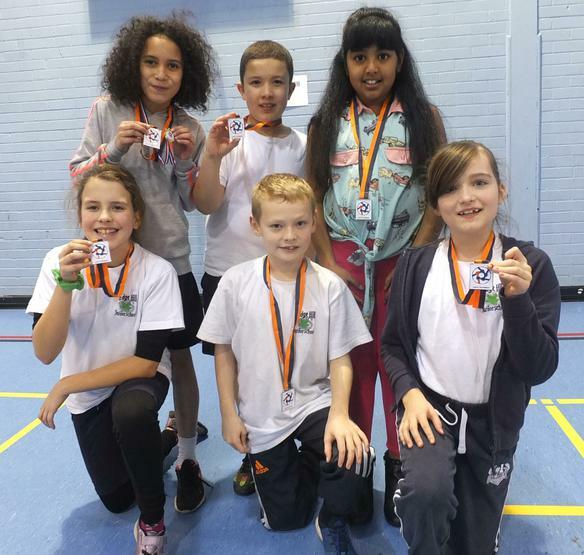 A team from Y3 and Y4 represented the school in this School Games qualifying event. The team was drawn in a group with St Modwen’s and Anglesey. They won their first match against St Modwen’s with a fine score of 259, conceding just 3 wickets! What made the win particularly pleasing was that the entire team bowled over arm with no chucking! Lily deserves a special mention for bowling her over with near perfect line and length. She’s developed a very effective bowling style. Well done, Lily! 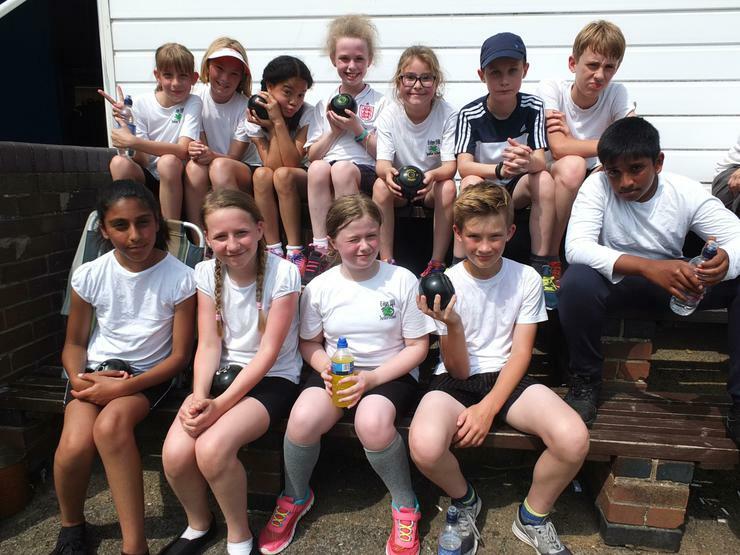 The team went on to win its match against Anglesey with a score of 247 runs for 5 wickets! Harrison whacked five sixes over the boundary during a lusty innings with the bat, bumping the team’s score up to a winning one! Excellent batting, Harrison! The team had reached the semi-final! Pitted against Rangemore School in the semi-final, the team faced some accurate fast bowling which cost us a fair few wickets. 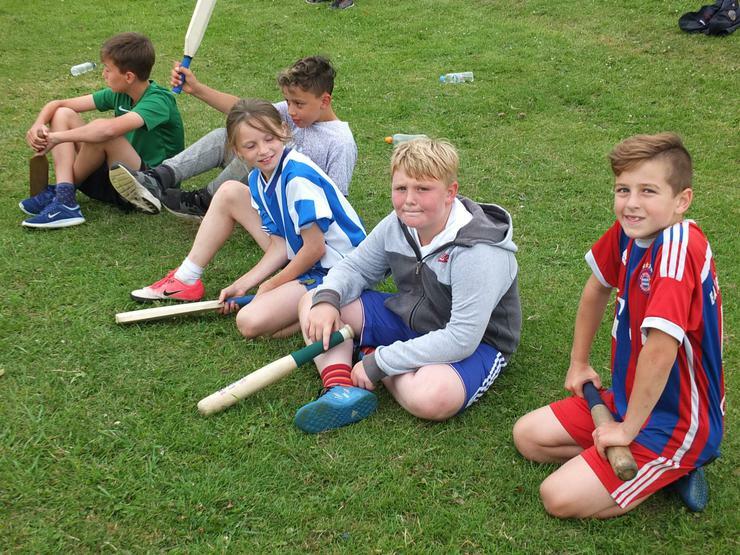 However, after another two overs with the bat by Harrison resulting in a hatful of 4s and 6s, the team gave itself a chance of winning the game, though we all felt it was probably not enough. Everyone was genuinely surprised to hear that we had lost the match by just one run! So close! Mia, Fearne, Jack S, Charlie, Harrison, Harry, Lily, Jack Sh and Kaden! Both Edge Hill teams were in action today playing their 1st round matches in the Ellis Shield knock-out competition. The Fives went a goal up with a shot from Spencer but Holy Rosary equalised during the second half of normal time. It was a hard fought game with neither side allowing the other to gain long periods of possession. With no additional goals scored by the time the whistle blew for the end of normal and extra time, a penalty shoot-out was held to decide which team would go through to the next round! This was the first shoot-out the Fives had faced this season. Unfortunately for the team, Holy Rosary came out on top after one of our shots hit the crossbar. However, the Fives put on a great performance and were unlucky not to clinch the tie in normal time! With four regular players unavailable for selection, Callum F, Hugo and Calum D stepped in to make up the numbers. 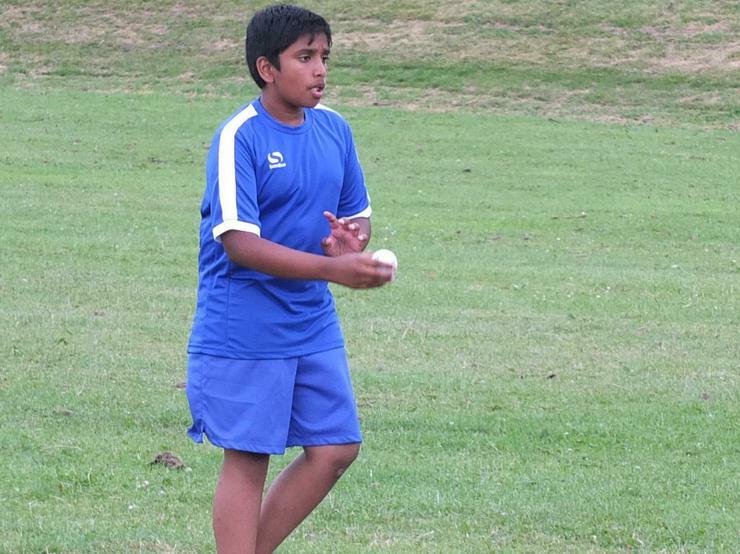 The team had met Eton Park in a close Britannia Cup match just a week ago, and this game mirrored it in the first half. Eton Park were the first to score but Ethan G equalised with a true striker’s goal in the second half! With the match in extra-time, Dylan got the winner after striding forward from defence to put a powerful shot into the back of the net! The Sixes now progress into the next round. A huge Well Done to the Y5 and Y6 boys and girls who played in the county tag rugby finals today! We needed to gain first or second spot in our group to make progress into the semi-final stages. After watching the other teams play each other prior to playing our first match, it was clear that the standard of tag rugby was high and qualifying would be tough! The team battled hard in all its four group matches, scoring tries in every game! Some fine running and try scoring from Lewis, Phoebe, George, Danny, Bradley and Kim ensured the team was always in contention. However, despite some excellent team play by Edge Hill, the organisation, experience and individual skill in the other teams kept us out of the qualifying positions. George, Abigail, Phoebe, Lewis, Elliot, Jack, Danny, Alfie T, Erin, Kim, Bradley and Will! Edge Hill hosted the Britannia Cup finals this evening to decide the winner of the trophy for this year. 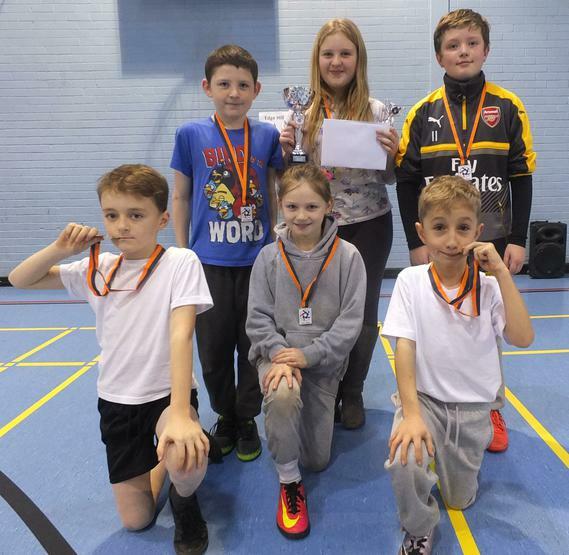 The top four league teams that qualified for the finals were: Edge Hill Sixes, Edge Hill Fives, Victoria and Eton Park. All the matches were competitive affairs with just one goal deciding many of the outcomes, testament to some fine play from all the teams! After two matches played, Victoria were ahead with two wins and only needed to draw their final game against the Sixes to clinch the trophy. 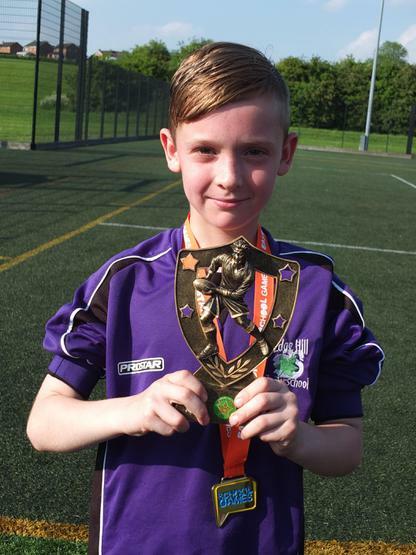 However, the Sixes raised their game and snatched victory (and the trophy) with some excellent attacking play by Man of the Match, Ethan! The Fives played brilliantly to hold the Sixes to a 0-0 draw and were unlucky not to win the match. In their final game, Phoebe picked up a win for the Fives after stroking the ball into the net! All four teams deserve a huge round of applause for putting on such a competitive show! A huge Well Done to all the players! 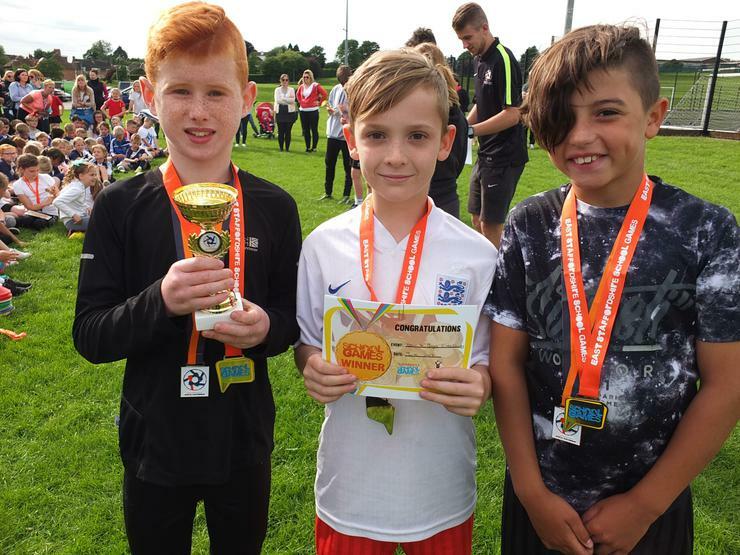 To help prepare our players for the School Games Qualifier later this month, we travelled to Uttoxeter to take part in this tag rugby competition. The team played four matches and finished in a well-deserved second place! Brooklyn, Harrison, Mia, Francesca, Omarion, Jack, Fearne, Sam, Kian, Jack S, Lily, Dru, Tyrun and Leo! 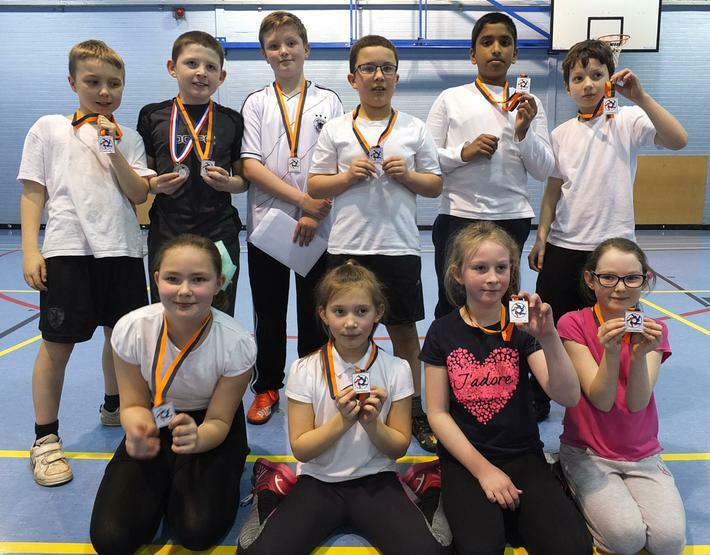 Despite a few regular players committed to other events, there was still plenty of interest from Y5/6 and two teams represented Edge Hill in this qualifier for the School Games Finals. Edge Hill I played three group matches, two of them resulting in narrow losses. They won their final match with some excellent drives forward by Harry, who scored a try and had another disallowed for diving over the try line (not allowed in tag rugby)! 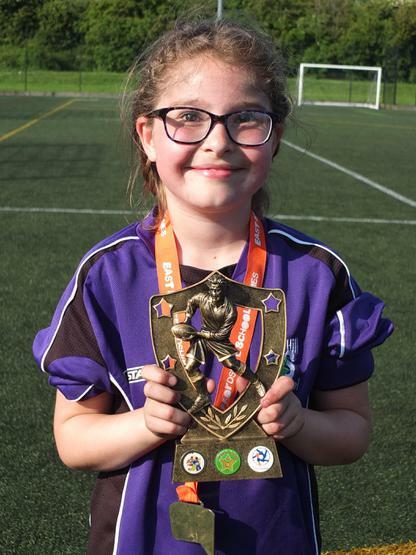 Also, a special mention should go to Lacey, who only joined the school last week, and has shown a real passion for sport! All the players gave it their all and were unlucky not to amass enough points for a place in the semi-finals. Edge Hill II won their opening group games 2-1 and 3-1 against Outwoods and Anglesey II but lost their final group match against Abbotsholme. However, the team had played brilliantly in their group and progressed to the semi-finals. The team met Anglesey I in the semi-final and, despite spending much of the game pinned inside their own half, Edge Hill II won the game by 3 tries to 0! The best try of the match was completed by Phoebe, the result of a great passing move starting in the team’s own half! The team met William Shrewsbury in the final. It was a close game containing some super passing by both teams. The team did really well, but when the whistle blew they were a try behind at 2-3. If the game had gone on a little longer, perhaps the score line would have been different, but well done to William Shrewsbury for showing real progression through the course of the competition! Edge Hill I: Isobel, Lacey, Matthew, George, Mithunam, Harry, Abigail, Alfie W and Samuel! Edge Hill II: Phoebe, Lewis, Elliot, Jack, Danny, Alfie T, Erin, Kim and Will! Two teams from Edge Hill and two teams from William Shrewsbury met after school today for a mini netball tournament. All four teams played against each other in a round robin format. Each game was a close affair in which all the teams showed plenty of skill and attacking verve. End to end stuff, in fact! Despite many shots at the net in the early matches, goals were hard to come by, and it wasn’t until the final games that goals began to decide the outcomes of the matches. Edge Hill B managed to win the tournament with 2 draws and a win. The difference between the teams was slim, however, and it was a very evenly matched contest! The players from both schools deserve a huge Well Done for being so competitive and for making the games so tight! 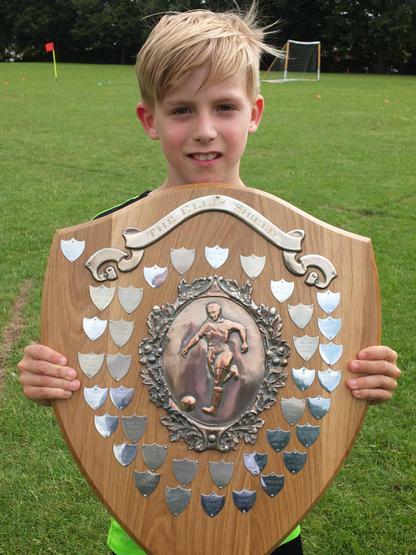 Edge Hill Junior School has topped the Burton & District Primary Schools Football League for the 4th season in a row. From their 11 matches, the Edge Hill Sixes team notched up 9 wins and a draw, averaging over 4 goals per game! 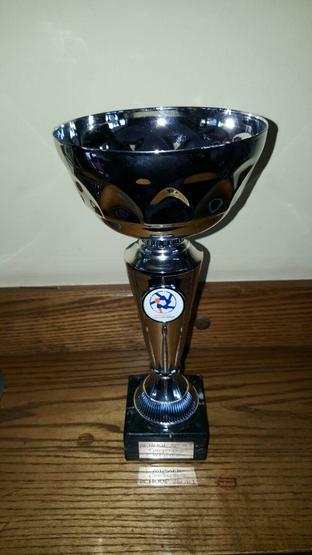 To cap off another great year, the Edge Hill Fives team clinched second place in the league with 6 wins and 3 draws! Huge congratulations to the players from both teams, who have shown dedication to the sport and a commitment to fair play and Respect throughout the season. Also, many, many thanks to the parents who have provided transport to and from the games. 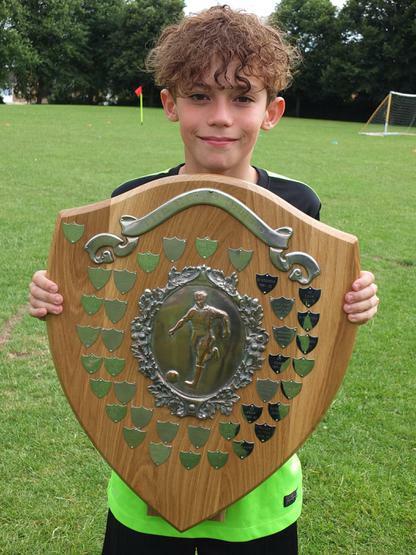 Now the league programme has been completed, the teams will compete for the Britannia Cup, Grantham Cup and Ellis Shield trophies, in addition to a tournament at Burton Albion. Forty excited footie fans from Edge Hill made the trip to Vale Park tonight to watch England Women play Italy Women! We arrived just in time for the national anthem, which the children joined in with on their way to their seats. The first half was a good game with the Lionesses making most of the chances but failing to get a goal. A lengthy injury to one of the Italy players added over 10 min to the half, so the children took the opportunity to stock up on pies and Bovril! The second half saw England go ahead, but Italy equalised soon after. The match finished 1-1 with England clearly the superior team. Completing just one more of the many chances they made would have seen them win the game. Even so, it was a brilliant experience for the children and everyone had a great time! For some, it was their first visit to a big football match and the occasion will stay with them for a long time. A huge Well Done to all of the children from Edge Hill, all of whom behaved impeccably and did themselves and the school proud! After school today, both Edge Hill football teams played their final league fixtures of the season. The Sixes opened with some good attacking play that resulted in a goal from Bradley. However, Tower View were always looking to get forward and equalised after catching the team out of position. During the next five minutes Tower view capitalised on too many Edge Hill players being around the ball leaving us horribly exposed on the left. Inevitably, the team went 2-1, then 3-1 down. After tightening things up at the back, the team started to push forward again and made lots of chances. Ethan G got a goal back but the whistle blew before they could even the scoreline. Though the team was always a threat in front of goal, they had forgotten about defending at the other end! Having seen the previous game, the Fives were aware of the dangers of being out of position and man-marked key Tower View players. They looked solid at the back with Isaiah and Jack in defence, and Lewis played one of his best games of the season in goal! Spencer had several chances at scoring, but it was Alfie who put the team a goal ahead after his first shot was pushed away! This was another well-earned victory for the team! After school today, our two football teams met Christ Church to play their tenth fixture of the season! The Fives went a goal up in the first half after Spencer poked the ball home from just in front of goal. However, Christ Church started the second half strongly and pulled level with a well worked goal. The Fives made more chances and could have snatched victory, but some good blocks stopped the team from getting the winner! Even so, this was another great performance by the whole team! The Sixes opened play with a one touch passing move that gave them the lead within the first minute of the game. Ethan G calmly put the ball into the back of the net! Bradley, the game’s man of the match, pushed forward constantly and netted two more goals to make the score 3-0 at half-time! The Bradley Show continued after the break when he doubled his tally to four goals, and Ethan I slotted home a penalty after being fouled inside the area. Well done Sixes for getting another win! 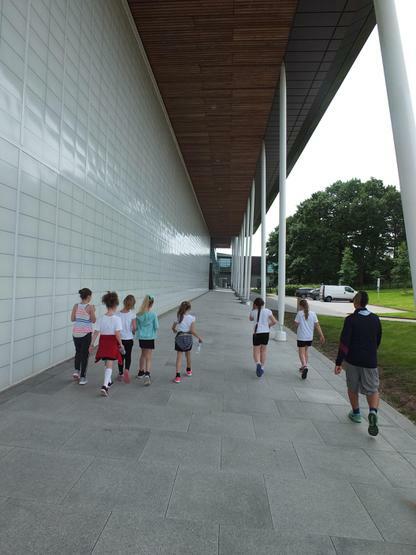 Twenty pupils from Y3 and Y4 visited St George’s Park this afternoon for a coaching and games session run by students on the football coaching programme at Burton College. The students led the pupils in skills and games sessions, where they took part in activities such as throw-in football. At the end of the afternoon, the children played matches against each other. 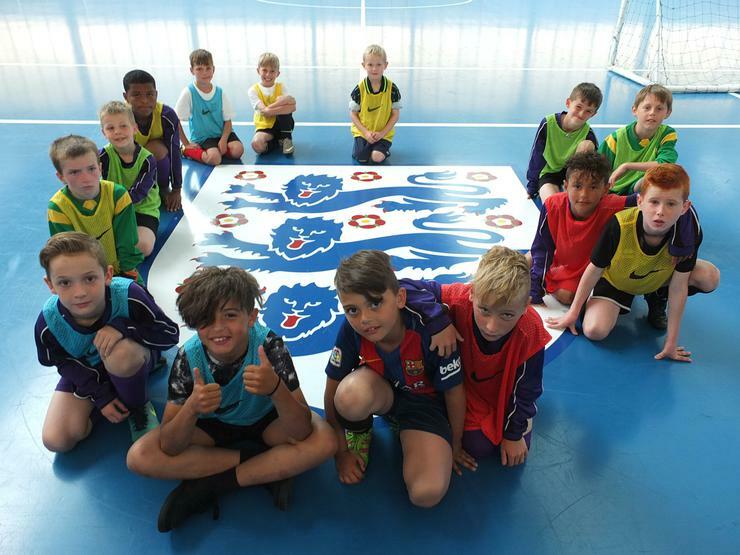 The Y3/4 pupils thoroughly enjoyed learning and practising their football skills in the sun, and everyone at Edge Hill wishes the students from Burton College every success in their studies! 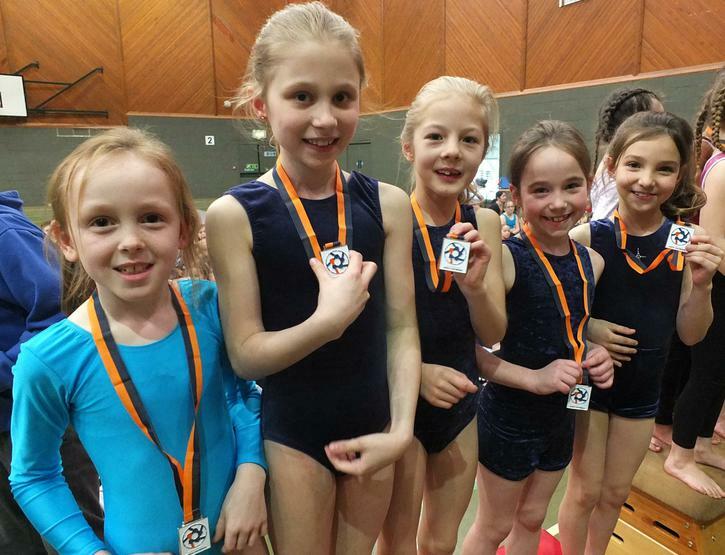 A huge Well Done to the four teams of gymnasts from Edge Hill who competed in the competition this afternoon. Huge credit goes to all of them for practicing their routines for several months, and showing the dedication and desire to do as well as they could! 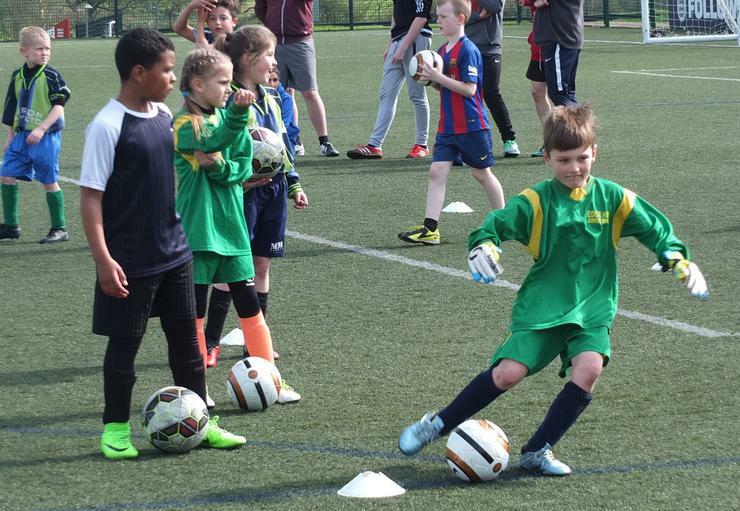 Over 100 children from schools across East Staffs took part in the competition. Each individual performed a floor routine and two vaults, with the best four scores from each team counting towards the team’s total. Any help with remembering routines resulted in a one point deduction. 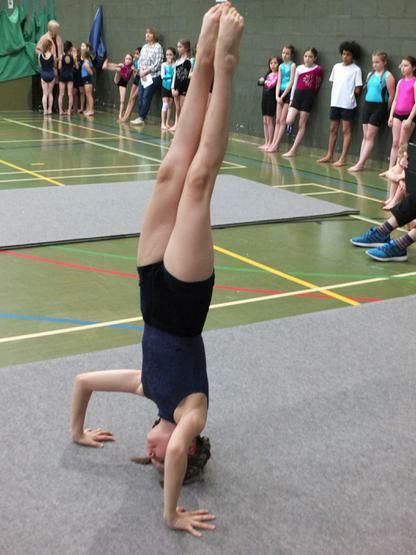 All of the Edge Hill gymnasts performed brilliantly and had clearly learned their routines off by heart! Even the less experienced members of our teams were superb! 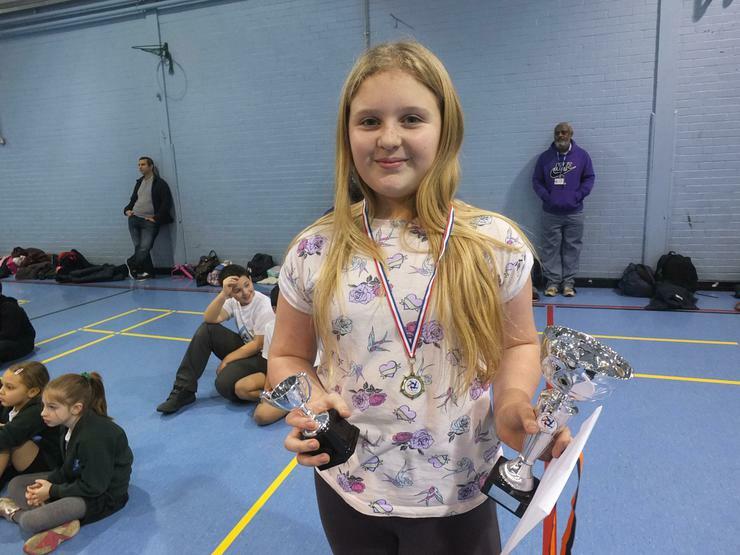 Our teams had successes against some very good individuals and teams from other schools, with Holly deserving a special mention for collecting silver medals for the second highest individual scores in the Y5/6 floor routine and the vault! Well done Holly! We are really, really proud of you! 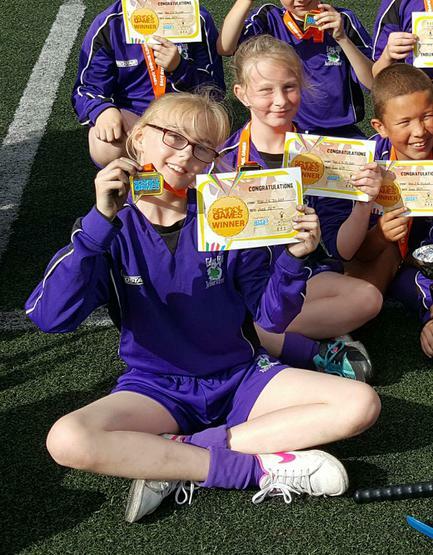 Also, our Y4 team were awarded silver medals for achieving the second highest overall score in the Y3/4 team event, and our Y6 team gained silver medals for the same achievement in the Y5/6 team event! This meant another silver medal for Holly! Finally, each and every member of the Edge Hill gymnastics squad took part with huge determination, even when nerves were starting to show. These competitions are often quite formal and overcoming fears is a key part of doing well. Our medal haul certainly shows that they did that! Y3: Izzy, Romily, Harvey, Ellie and Georgia ! 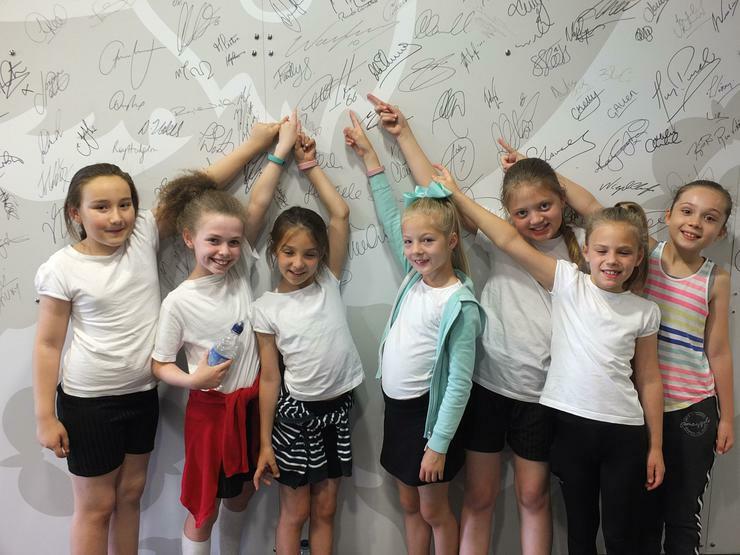 Y4: Mia, Skye, Faith, Kacy and Chloe! Y5 :Katie, Demi, Nicola, Olivia, Alfie and Sophie! Y6: Evie, Grace, Paige, Holly, Jasmine and Keira! 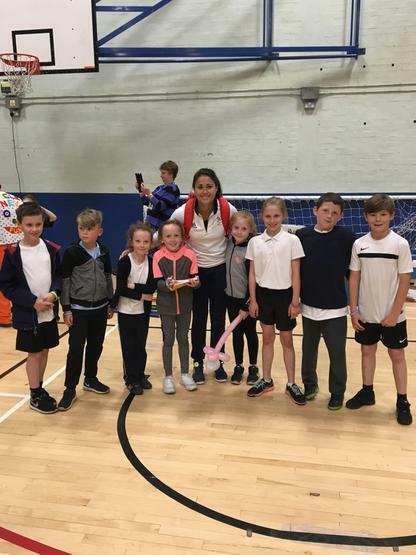 Following a postponement of the league fixtures against Kingfisher, the Edge Hill Fives and Sixes teams met to play their first match against each other. The Fives adopted a defensive approach in order to contain the firepower of the Sixes, and hoped to hit them on the break. The plan worked well in the first half (which included chances at both ends), resulting in a 0-0 score line at the end of the first period. However, early in the second half Ethan G breeched the Fives’ defence with a shot from the right. Soon after, Ethan I slotted a free kick through a three man wall, making the score 2-0 to the Sixes! Positioning began to slacken off a little after that as the Fives pushed forward, but their attacking play was rewarded when a fine corner from George was neatly side-footed in by Spencer. The attacks by both teams started to come thick and fast from then on, though it was Ethan G who got the next goal, sealing the win and a 3-1 result for the Sixes! Both teams had played brilliantly with plenty of determination and skill, and both teams deserve a huge round of applause for putting on an excellent show! Edge Hill Fives: Spencer, Phoebe, Jack, George, Lewis, Alfie, Will and Isaiah! Edge Hill Sixes: Flynn, Ethan G, Oliver, Evan, Dylan, Ethan I, Cole and Bradley! History repeated itself today when Edge Hill reached the final of this competition only to lose on penalties after normal time ended in a goalless draw - just like in last year’s final! Edge Hill A won their group by notching up plenty of wins and goals against Oldfields and Windsor Park A teams. Apart from Evan in goal, all 7 outfield players got on the scoresheet during the tournament - testament to their excellent attacking play! The team got through their semi-final after slotting home all 5 spot kicks in a penalty shoot-out, but couldn’t quite manage to pull off the same feat after the final ended goalless. However, once again the team showed that they are force to reckoned with in East Staffordshire. Well done to all of the players for getting so close! Edge Hill B, made up entirely of Y5s, faced some big Y6 players but didn’t let that faze them by gaining two draws and a loss in their three group matches. As usual, they created plenty of chances with Spencer and Alfie getting goals for the team. They were disappointed at not getting through to the semis, but put on a fine show against the older children they played against. Well done team! Edge Hill A: Flynn, Bradley, Ethan, Evan, Dylan, Cole, Ollie and Kacper! Edge Hill B: Spencer, Phoebe, Isaiah, Jack, Alfie, Will, Lewis and Danny! Two teams from Edge Hill took part in this local tag rugby competition after school today. Edge Hill A played in a tough group but gave it their all. They didn’t manage to win their group and get to the final but improved with each match they played. Best of all, the team clearly enjoyed competing together as a team, and showed plenty of determination to do the best that they could! Well done to the team for trying so hard! We were very proud of you all! Edge Hill B competed in a different group and played brilliantly to win their group and then win the final! Right from the whistle, Edge Hill B came out of the blocks and applied pressure to the opposing team. The first game was their toughest by far against a very fast and strong performing Holy Rosary, but early tries from Harrison, George and Alfie took them to victory. The team had never played together before and were full of energy, also making countless 'tag' tackles to provide a strong defence! The second game saw the team grow in confidence with a number of tries scored by Bradley, Phoebe, Elliot, Jack and Alfie. They didn't let up and pressured Victoria throughout the game. During the game, there were a number of passes which created space and allowed the team to find the try line on a number of occasions. The third group game set them up for the final. There were tries scored again by Phoebe, Harrison, Alfie, Lewis, Elliot and Jack. Their defensive work was outstanding, with tag tackle after tackle preventing the opposition from scoring. The final was against Outwoods. An early surge down the wing from Harrison put the team ahead and then further tries from Alfie and Phoebe secured the victory. Outwoods defended well and put pressure moving forward on the team, but Edge Hill held their positions and applied their own pressure to force errors and turn over the ball which allowed the team to take advantage of the play. The performance in all the games was fantastic and their passing and supporting play was the difference between the teams! Edge Hill A: Harry, George N, Joe, Abigail, Alfie W, Dru, Isobel, Sam, Lucas and Keane! Edge Hill B: Bradley, Will, Alfie T, Harrison, Phoebe, Fearne, Jack, Elliot, Lewis and George H! Ten children from Y5/6 represented Edge Hill in tonight’s canoeing competition. The team performed really well and gave it their all (especially Mith, who was feeling a little under the weather but was determined to take part)! Congratulations go to Bradley for winning the medal for the longest distance paddled in 1 minute – 176m! Also, kudos to the entire team for finishing third and winning bronze medals! A Huge Well Done to: Ben, Kasey, Bradley, Mith, Amelia, Holly, Keane, Katie, Adam and Lewis! Twelve keen Y5/6 children made the short trip to Robert Sutton for this taekwondo session. Led by qualified taekwondo instructors, the children were shown how to punch and kick, use their forearms and how to swivel to gain more power. 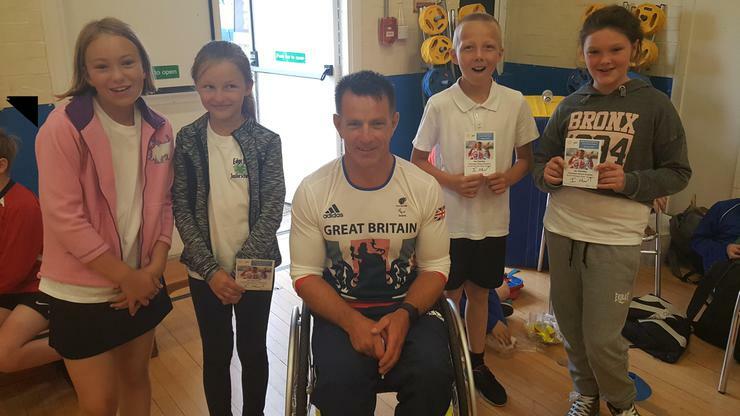 It was great to see lots of new faces among the children who attended the session – especially from Y5 – and maybe some of them will take up the sport and become part of the very successful GB taekwondo team! 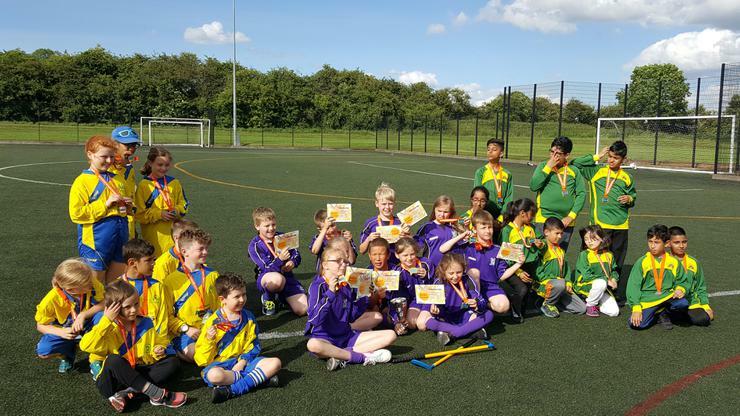 Having finished as runners-up in their last tournament here, the Y3/4 football teams were keen to go one better this time! Edge Hill A played three matches in their group, winning all of them! In the final, they played All Saints from Alrewas, dominating the game and winning 1-0 with a goal from Charlie P. Defensively the team was exceptional, tracking back superbly and with some phenomenal tackling. The team notched up four clean sheets with very little action on their goal, and are getting better and better each time they play! Edge Hill B also played three matches, staying unbeaten with a win and two draws! The team had played with real determination to gain a semi-final place! Despite creating a last minute chance which would have won the game, the semi-final finished 0-0. Extra time was played but unfortunately they were caught out by a long shot from outside of the area and the game finished 0-1. Regardless, the team played brilliantly! Edge Hill A: Jack So, Charlie P, Cole, Harrison, Zack, Jack Sh and Omarion! Edge Hill B: Kian, Brooklyn, Ellis, Leo, Charlie C, Sam and Jack S! After school today, the Edge Hill Fives and Sixes teams travelled to Anglesey Primary Academy to play football league fixtures against the Anglesey team. The Sixes played first against a skilful and determined Anglesey team. In the first half, the Edge Hill team hit the post twice with a further attempt flying off the crossbar. Then Flynn put the team ahead just before the whistle blew for half time. More goals came in the second half when Flynn coolly slotted home his second. This was quickly followed by two great goals from Ethan G. A penalty award presented Ethan with a chance to get his hat-trick, but the shot was saved. 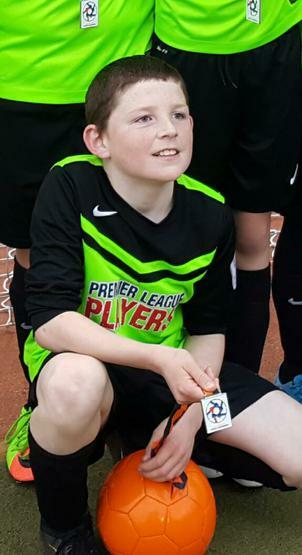 The team’s fifth and final goal came from Ethan I, who fully deserved to get on the scoresheet after a performance brimming with individual skill throughout the entire match. This was a very impressive team performance following a winter break of two months. Evan was super secure in goal, Kacper, Dylan and Oliver solid at the back, and Cole, Ethan G, Ethan I, Bradley and Flynn always a threat in attack! Well done team!! With Danny missing at the back and Jack missing on the wing, the Fives were down two influential players tonight. Though they worked hard to create some great chances in the first half, the team was 2-0 down when the whistle blew for half-time. Consequently, if they were to get a result in this game, they had a lot to do in the second period! Fortunately, Spencer’s calm in front of goal and some great pressing by the rest of the team managed to save the day! Will and Isaiah shored things up at the back, George, Will and Alfie disrupted attacks and turned the ball around, and Spencer showed his class with four great goals. Also, Phoebe had a hand in one of the goals with a deft assist, and Lewis kept a clean sheet to protect the team’s hard work in the second half! Well done Fives for pulling this one out of the bag! Edge Hill Fives: Spencer, Phoebe, George, Lewis, Alfie, Will and Isaiah! Edge Hill Sixes: Flynn, Ethan G, Oliver, Evan, Dylan, Ethan I, Kacper, Cole and Bradley! 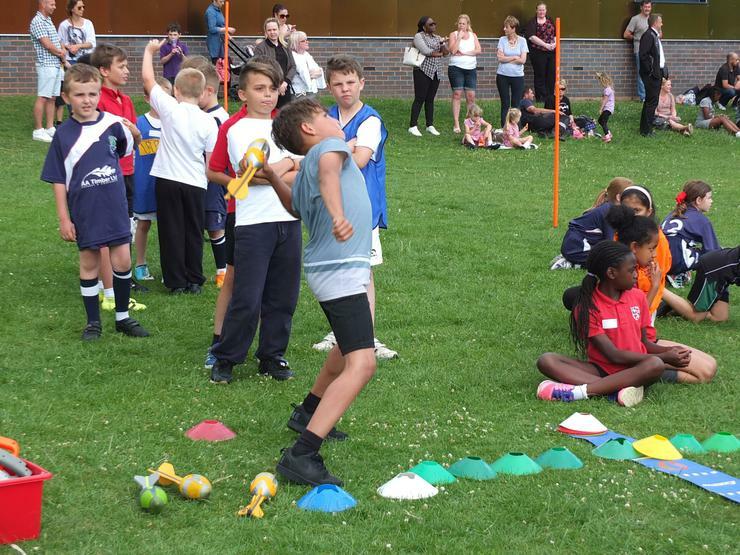 A team from Y5/6 attended this event to showcase their swimming skills against other schools from East Staffordshire. The team competed in different races for freestyle, breast stroke, back stroke and butterfly. Races came thick and fast for individual girls and boys, and mixed relays took place for each of the different swimming strokes. The swimmers from Edge Hill achieved their best results in the individual races, with several finishes high in the placings. As usual, the competition was of a high standard with some excellent swimmers taking part, but the team gave it their all and did really well to finish in 5th place overall! Tegan, Connor, Erin P, Katie, Josh, Owen, Maddie, Theo and Ciara! Edge Hill has a good record in this competition, having reached the final in each of the last two years. 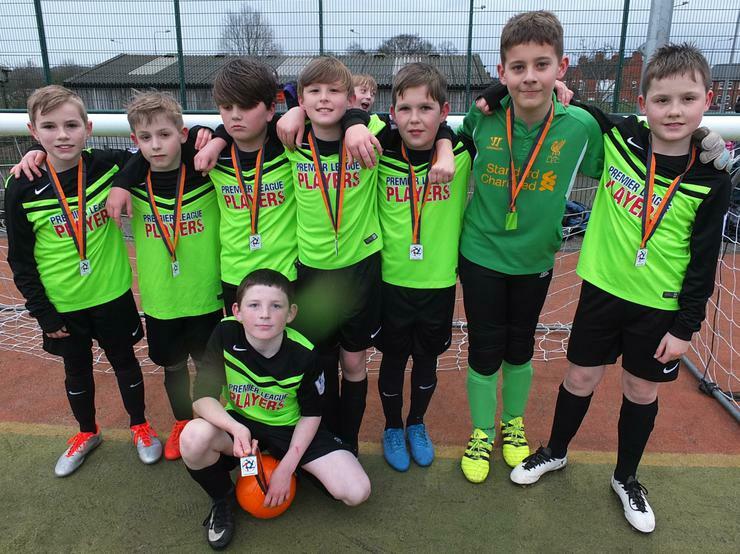 Two teams made up of players from Y5 and Y6 represented Edge Hill in this year’s competition! Edge Hill B played 3 group matches, winning 2 of them and losing the other. With these results there was a chance that they could qualify as best runner-up from the 3 groups, but sadly they didn’t quite do enough to get through to the semi-finals. However, they played brilliantly and very competitively. One of the highlights was seeing Holly pirouette away from many, many balls that were thrown her way! Even the teacher from the school they lost to congratulated her on her excellent dodging skills! Edge Hill A won all of their group matches against Holy Trinity, St Modwen’s B and Windsor Park, dropping just 2 games on their way to the semi-finals. The semi-final against Christ Church was a tighter affair, but the team won their match after notching up 2 wins and a draw! For the third year running a team from Edge Hill had reached the final! 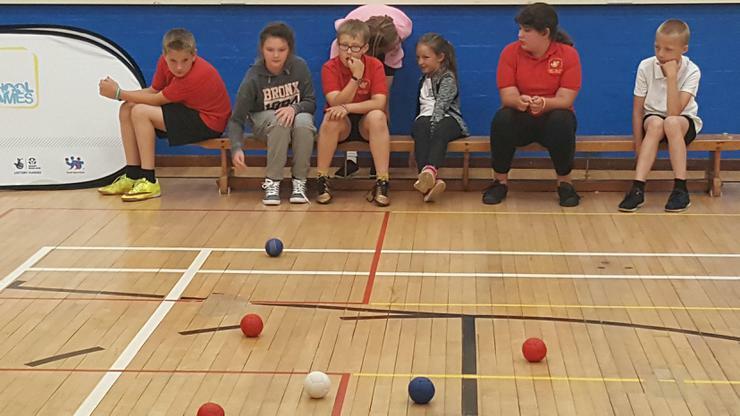 Though the children played with the same amount of determination they had shown throughout their journey through the competition, the team’s throwing accuracy sadly deserted them in the final. Even so, despite losing the first 2 games of the final, they competed right to the end with Erin snatching the final game as a consolation for the team! Edge Hill A: Erin, Dylan, Flynn, Harry, Spencer and Hugo! Edge Hill B: Sammy. Holly, Elliot, Mithunam, Danny, Alfie and Lily! We held lunchtime trials to find some talented young archers for this competition, and it certainly paid off after our two teams made up of Y4, Y5 and Y6 children finished in first and second place in tonight’s competition! Edge Hill B amassed a total of over 150 points after shooting 10 arrows per player at the targets, well ahead of the team in third place and, amazingly, Edge Hill A scored over 200 points after each player had shot 10 arrows. A fantastic result! Edge Hill A: Bradley, Harry, Sammy, Sophie, Phoebe and Ben! Edge Hill B: Erin, Janusha, Isabella, Lewis, Ethan and Kimberley! A team from 5CL and a team from 5HN represented Edge Hill in this School Games Qualifier for the County Finals. Both teams played really well, winning some of their group matches whilst narrowly losing others. 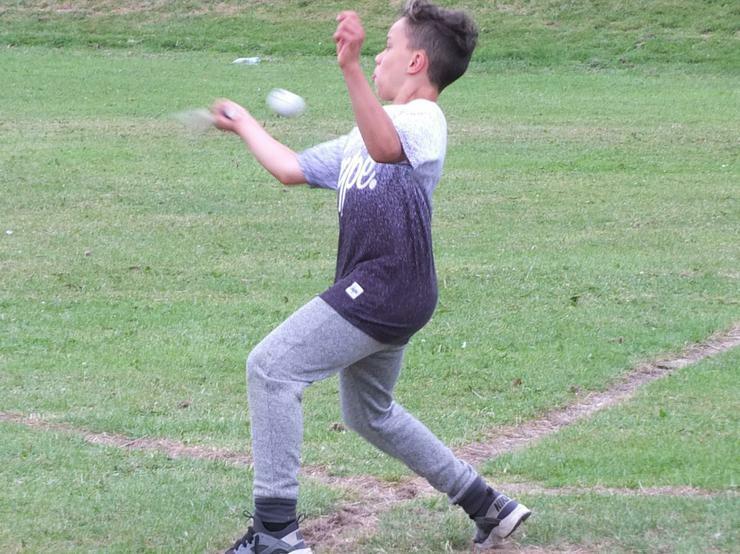 As usual, the individual games were very close affairs and were often decided by a single winning ball – especially when the jacks were sent out long. The Edge Hill B team tried their hardest but unfortunately did not win enough games and matches to get them to the semis. However, Edge Hill A did brilliantly to finish their group with enough points to win a semi-final place! In their semi-final, Edge Hill A won both opening games against Shobnall B to secure a place in the final! Much excitement followed as they waited to see who they would meet. 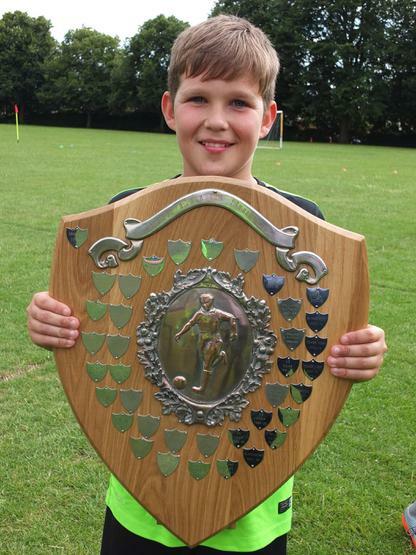 The final was against William Shrewsbury and, like all of the other matches, consisted of 3 games. The team narrowly lost the opening game 1-0, then pulled level by winning the second game also by a 1-0 scoreline. The deciding final game went to Edge Hill after the opening ball stayed unbeaten throughout the entire game! Well done team!! Hooray!! 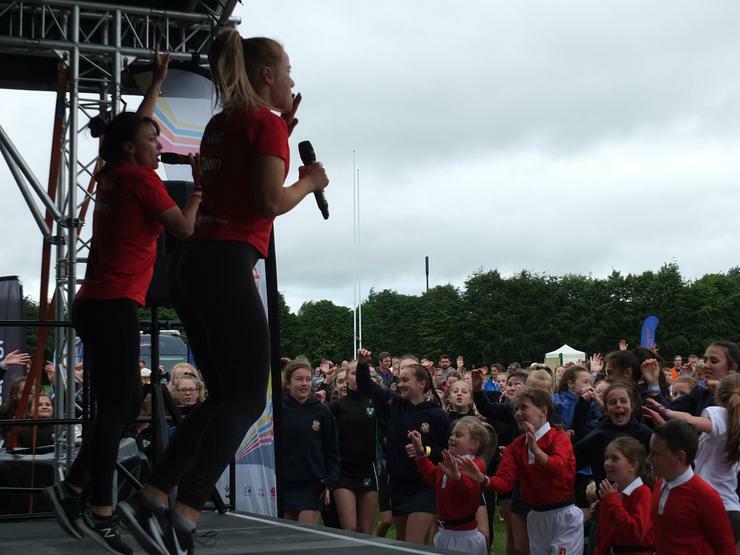 As well as winning the trophy and gold medals, this means that Edge Hill will go forward to the School Games Finals at Keele University in June! Edge Hill A: Jorja, Charlie, Conner and Holly! Edge Hill B: Josh, Lily, Isobel and George! 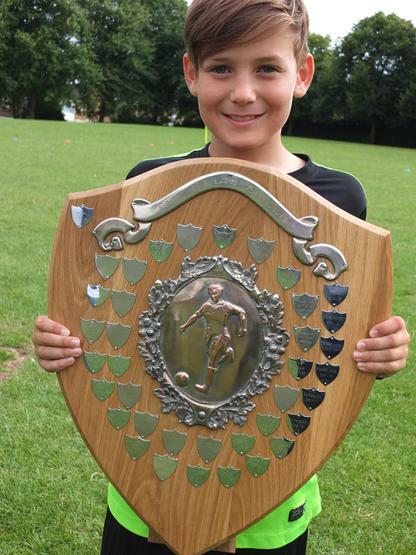 Edge Hill Junior School currently holds all of the local football trophies: the Burton and District Primary Schools Football League trophy, the Britannia Cup, the Ellis Shield and the Grantham Cup. 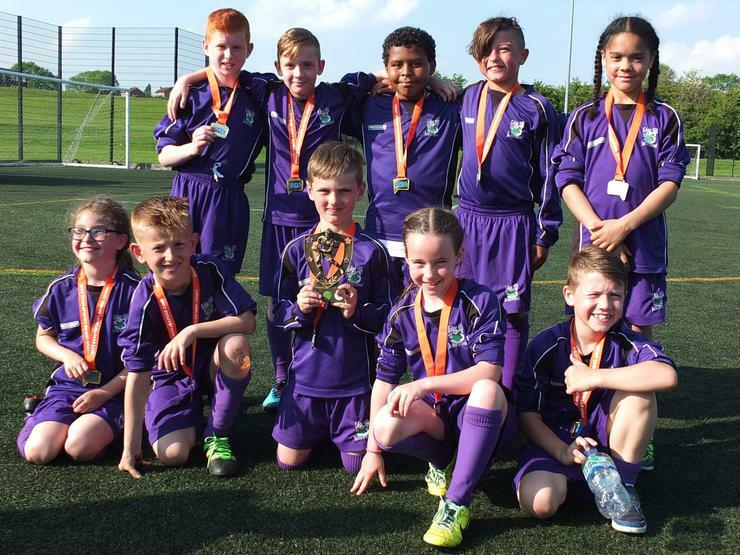 Our two school football teams had a brilliant season in 2015-16 by finishing 1st and 2nd in the league. Also, both teams qualified for the Britannia Cup, and even met each other in the final of the Ellis Shield! It's a rare occasion when one school wins all of the competitions, so here are all the trophies together. 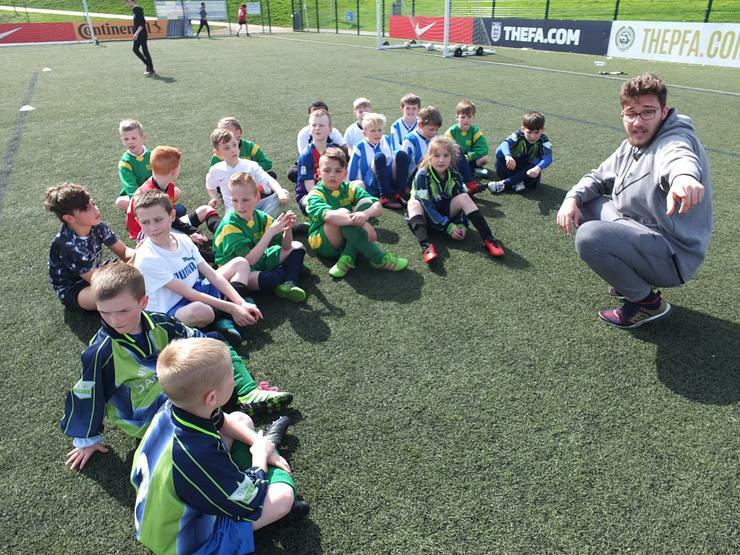 Our Y3/4 footballers travelled to Uttoxeter to take part in this tournament. In the semi-final, they met Richard Wakefield again. This time they won the game in extra time by just the 1 goal from Harrison! The final was against St Modwen’s A. The teams were evenly matched and the game ended 1-1 after extra time, with both goals coming from goalmouth scrambles. Unfortunately, the team came out second best in the penalty shoot-out, narrowly losing 3-4. However, the team has reached the final in both tournaments they’ve played in, winning the first and gaining the runner-up spot in the second. A pretty good record! Edge Hill B also played three matches but didn’t quite do enough to progress further. The team had chances to win both of the games they drew, and could have scraped through to the semis as best runner-up, but it wasn’t to be. Even so, they played with lots of determination and should get better and better with more matches! Edge Hill A: Jack S, Charlie F, Cole, Harrison, Zack, Charlie P, Sam and Max! Edge Hill B: Jack Sh, Ryan, Kian, Jack S, Ellis, Leo and Omarion! Nearly 30 Y3 and Y4 children from Edge Hill volunteered to take part in this evening’s competition. They didn’t have much experience of canoeing, but they were all very enthusiastic and excited about taking part! 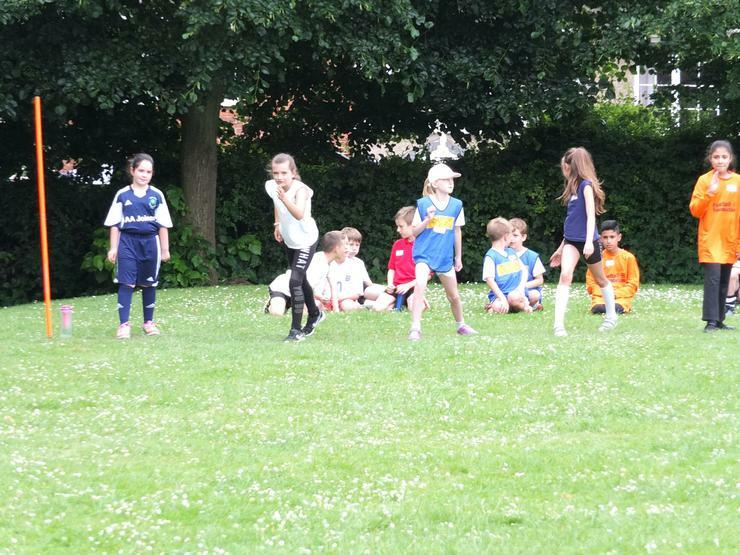 Each of our 3 teams competed in a girls’ race, a boys’ race and a team race. In the last race, the teams had to paddle 1250m, taking turns to get as far as they could before handing the paddle to the next member of their team! Though they didn’t win the competition, all the children were brilliant and tried really hard to master the unfamiliar paddling action. A Huge Well Done to all of the children who took part! The Edge Hill Fives and Sixes each played two league fixtures after school today. Edge Hill Fives 1-0 Holy Rosary Despite missing two key players, the team played brilliantly to win against Holy Rosary. Danny ran things at the back and got forward when he could, with Will filling in for him when it mattered. As a result, Lewis was rarely threatened in front of goal. Jack got the winning goal which the team fully deserved! Edge Hill Sixes 11-0 Horninglow The Sixes turned Horninglow's first league match into a bit of a rude introduction to the inter-school football scene. Flynn rattled in 7 coolly taken goals, and Bradley relished his forward role by getting a hat-trick! Edge Hill Fives 1-1 Horninglow The Fives played another great game but lacked the final touches to put them ahead. It wasn't until the second half that Alfie put the team in front with a great shot from outside the area. There were more chances to seal the 3 points, but Horninglow grabbed an equaliser right at the end of the match! Edge Hill Sixes 4-0 Holy Rosary The Sixes rounded off the evening with another excellent performance and another clean sheet! 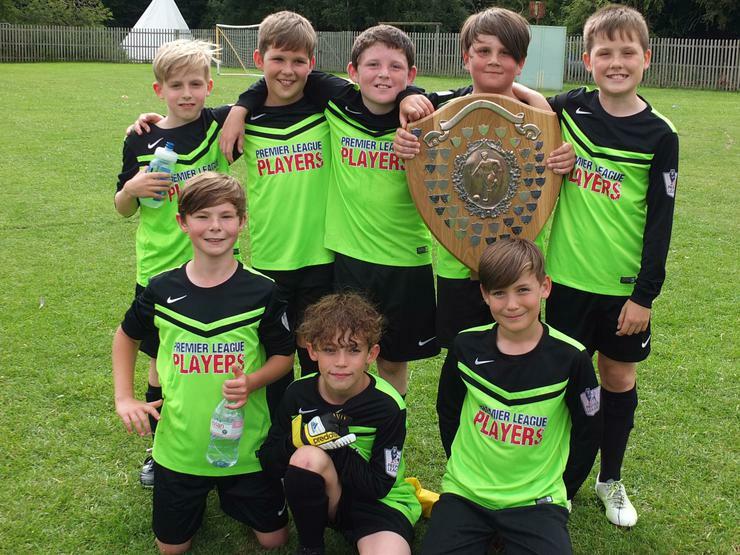 Fives: Danny, Alfie, Lewis, Will, Jack, Isaiah, Phoebe and Jake (debut)! 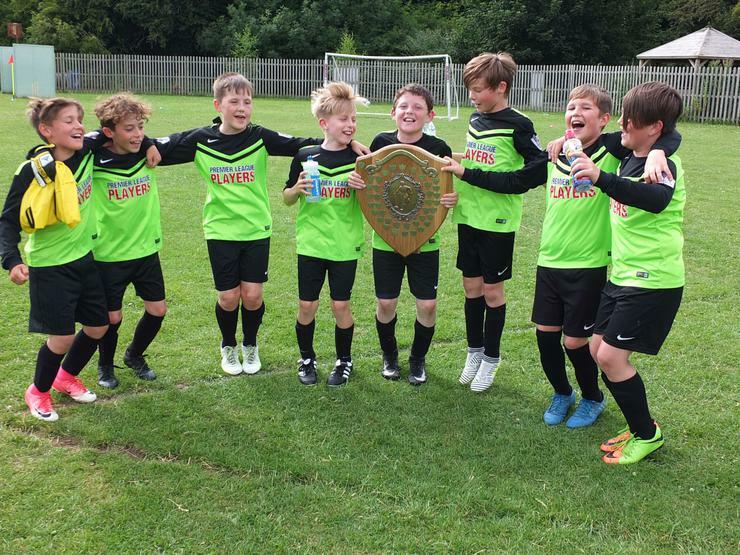 Sixes: Flynn, Oliver, Dylan, Kacper, Evan, Cole and Bradley! 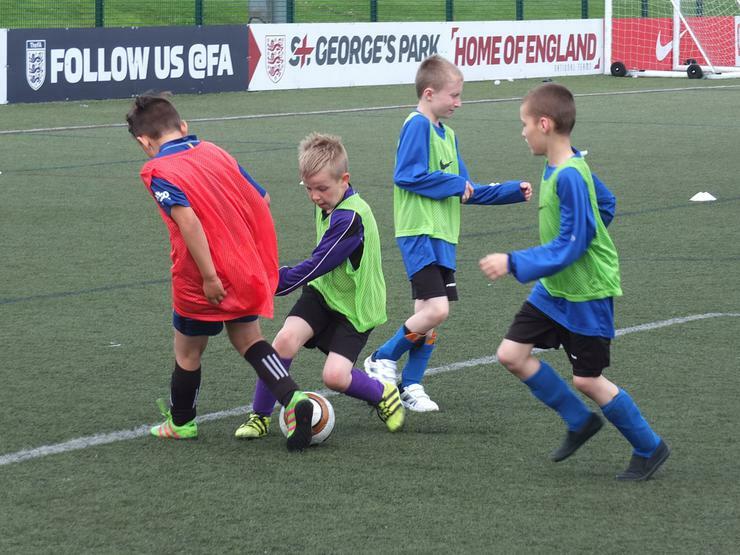 Our 2 football teams competed in this tournament to represent Burton Albion at the regional finals later in the year. The Y5 team played with tons of energy and were a threat to each of the 4 schools they played against. Danny was majestic in defence and (if he resists the urge to keep trying to get forward so much) should be a mainstay of future Edge Hill teams. The rest of the team pressed constantly and created loads of chances. They didn’t manage to win their group, but they played brilliantly! The Y6 team played 5 matches against the other schools in their group and were unbeaten with 2 wins and 3 draws. They were a goal up against Alrewas in their final match, which would have won them the group and a place in the semis, but a last-minute equalizer scuppered the team’s progress. This was the only goal the team conceded in all their matches, and they were very, very unlucky not to go through. The Y6s were clearly one of the best teams there. However, a huge Well Done to both teams for playing with skill and passion in every game they played! After school today, our two football teams played their league fixtures against Eton Park. This was a closely contested game and it took a goalkeeping error to break the deadlock between the teams. Spencer latched on to a weak clearance by the Eton Park goalie and put the ball into the back of the net. The Fives did create more chances, but the opposition pushed players forward and overwhelmed our defence at times. Will was dropped back to help strengthen the back line, but a powerful shot from outside of the area pierced our defence and made the score 1-1. The Fives did have chances to win the match, but it was a close game and a draw was probably a fair result. The Sixes were strong going forward and there were spells where they were camped in front of the Eton Park goal. However, the team’s dominance proved to be fruitless as the chances they made did not convert into goals. The team gained the lead in the second half when a Dylan Special caught the goalie off his line. The ball looked to be heading over the crossbar but dipped into the net over the goalie’s head. Another great goal from Dylan from well outside of the area! Flynn secured the win for the Sixes with a strong shot that went in off the underside of the crossbar. After 5 games the Sixes remain unbeaten and top the league at this stage! Edge Hill Fives: Spencer, Phoebe, George, Jack, Lewis, Alfie, Danny, Will and Isaiah! 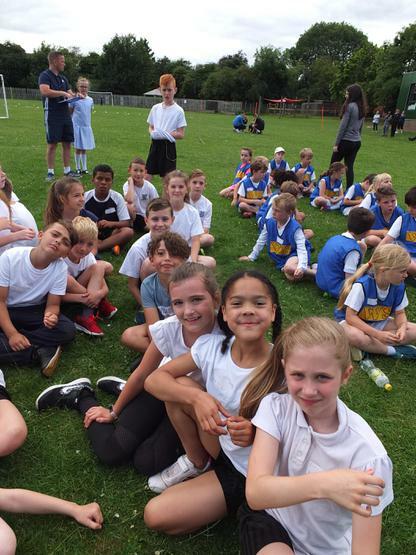 Twenty-five young athletes from Y5 and Y6 represented Edge Hill in this hard-fought competition. The track events were in the form of relays that took place over multiple wall to wall distances, whereas the field events included the chest push, vertical jump, speed bounce, soft javelin and standing triple jump. The boys’ team and the girls’ team did have successes, but were up against some stiff competition and fine athletes from other schools. Even so, they managed a creditable 3rd place in the competition and received bronze medals for their efforts. After school today, the Edge Hill teams played their league fixtures against Victoria Community School. Without George, one of the key players in the Edge Hill Fives’ team, this match was going to be a challenge, and it proved hard to get on top of the game. However, the players battled and defended brilliantly to get the win. Lewis put in his best performance of the season with many blocks to keep a clean sheet for the team. 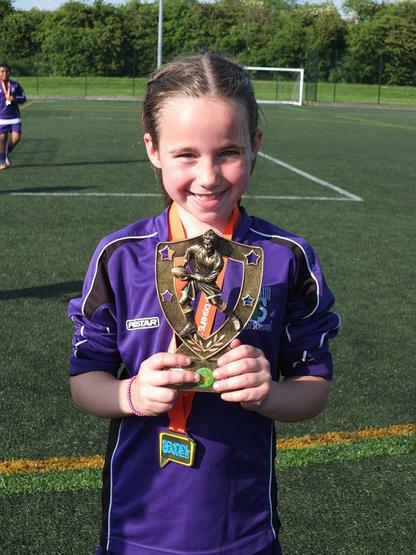 The winning goal was put away by Phoebe after an excellent counterattack by half the team! The Sixes gained the lead in the first half with a goal from Ethan G. In the second half, Flynn put the team 2-0 up with a long shot into the bottom left corner of the net. However, Victoria started pushing players up the pitch, often outnumbering our defence. As our front players pressed forwards, long clearances by their goalie started to threaten at the other end. Evan made a fine save which Victoria’s front players latched on to and put away, making the score 2-1. The Sixes continued to create chances which drew some fine saves and blocks by the Victoria goalie and defence, but unfortunately another long ball left us outnumbered at the back again and the opposition gained an equaliser. The game ended 2-2 after more scoring chances at both ends! Edge Hill Fives: Spencer, Phoebe, Jack, Lewis, Alfie, Danny, Will and Isaiah! Forty excited young trampolinists from Edge Hill visited Robert Sutton for two trampolining sessions run by Y10 Sports Leadership students. Supervised and coached by the Y10 students, the children took turns to practise using the trampolines safely. Also, the more advanced children were shown how to introduce gymnastic shapes whilst in the air. Many thanks to the Y10 students for organising the sessions. Everyone at Edge Hill wishes them well in their leadership training! Three Y5 boccia teams from Edge Hill took part in this evening’s tournament at Robert Sutton Catholic Sports College. Edge Hill A played in a group where some very long jacks were sent out by the opposing teams, making it much harder to gauge the strength of the ball rolls. Even so, they did brilliantly to win two of their four matches and were just one win short of making the semis! Edge Hill B did excellently to win all three of their matches. Some match winning shots from Isobel saved the day on more than one occasion, and secured a semi-final place for the team! Edge Hill C started off with a convincing 3-0 win against Victoria A, then narrowly lost their other matches 1-2. These were tight games, however, and one accurate final ball could have swung the result in favour of the Edge Hill team! Fortune deserted the B team in their semi-final against Alrewas A and they narrowly lost both games 1-0. Just a bit of luck would have seen them go through to the final. Nevertheless, they played brilliantly in their first competition and were a credit to themselves and to the sport. Two very keen teams of girls from Edge Hill took part in today’s competition! Edge Hill A competed in a strong group and did really well to stay unbeaten. They started off with a goalless draw against William Shrewsbury A team. The team did have a few chances but there were scares at the other end too. 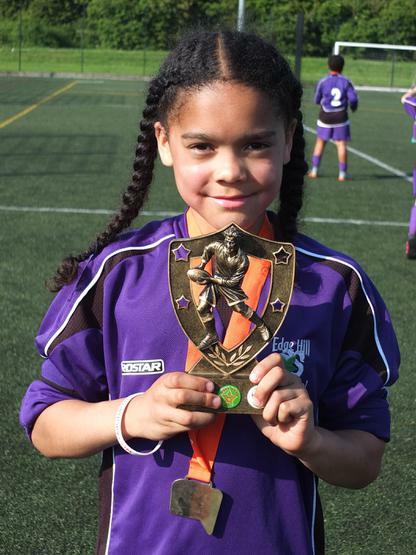 However, Kimberley put in a great goalkeeping performance to make sure we didn’t concede a goal! The team won their next match against Shobnall with goals from Phoebe and Ellie. A win in the final group game against Kingfisher B would have most likely ensured the team’s progression into the semis, and it certainly seemed as if they would achieve this because the team spent almost the entire match camped in the opposition’s half! However, despite countless shots at goal, the win eluded us and the match ended 0-0. Although unbeaten in the group, Edge Hill A sadly didn’t accumulate enough points to progress any further in the competition. The Edge Hill B team contained much less experience than the A team but what they lacked in skill they made up for in determination! Though they didn’t manage to qualify for the semis, they tried really hard and never gave up once! Also, Naemh, Jorja and Demi deserve a big pat on the back for stepping in at short notice! A Huge Well Done to: Edge Hill A: Phoebe, Ellie, Tegan, Erin M, Kimberley, Sienna, Erin P and Holly! Edge Hill B: Katie, Olivia, Demi, Elsie, Naemh, Rebecca, Abigail and Jorja! This evening, our two teams travelled across town again for more away fixtures. Bradley opened the scoring with a successful penalty after a player handled the ball in the area. He also played a part in the team's second goal when he put in a great cross from the right which landed right at Flynn's feet! Flynn only had to side foot it into the net. In the second half, Ethan G broke forward and nutmegged the goalkeeper to get the team's third and final goal to cap off a solid team performance and another win! 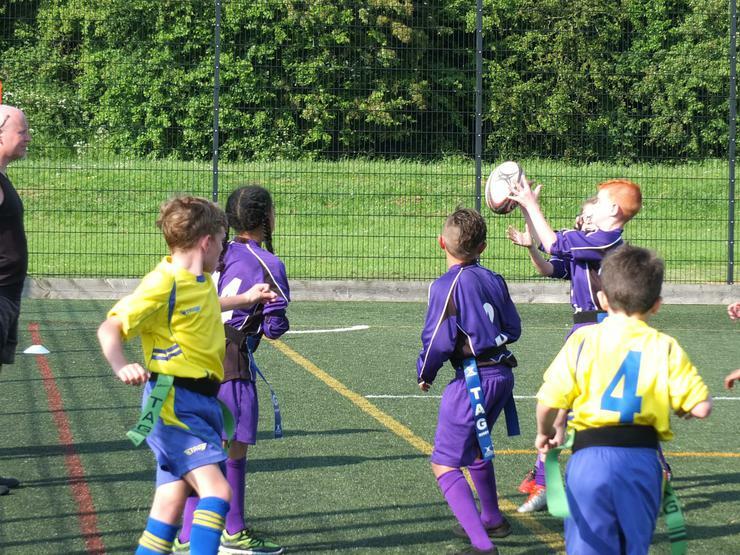 The Y5 team put in a great performance by matching the scoreline from the previous game! Spencer was a danger early on and opened the scoring for the team. The tireless George put in a great shot on goal that was parried but fumbled into the net! 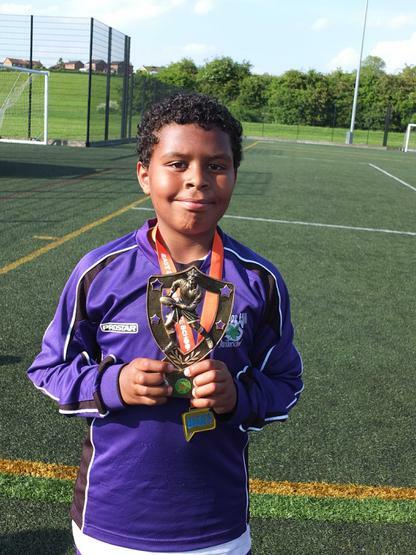 Isaiah got on the score sheet with a goal that came from a super cross by Alfie. The ball went in off the inside of the post, making the score 0-3 to the Fives. This was a fine performance from the team, and probably their best so far. It's great to see them gelling as an attacking unit! Edge Hill Sixes: Flynn, Bradley, Ethan G, Oliver, Kacper, Evan and Cole! Edge Hill Fives: George, Spencer, Lewis, Isaiah, Alfie, Danny and Jack! 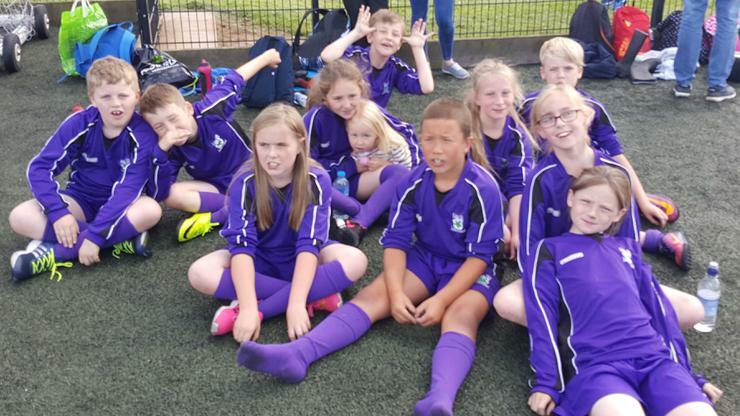 Our Y5 team - Edge Hill B – played in a tough group but competed at a high level against teams made up of mostly Y6 players. Though only a year younger than most of the other players, the size difference was obvious! Even so, they gave a great account of themselves and even managed a draw against the team that went on to win the tournament! The Fives didn’t manage to win their group and progress further in the competition but played brilliantly! Well done team! Next year it will be your turn! Edge Hill A – the Sixes – won their group and were undefeated after 4 matches, notching up draws against Holy Rosary and William Shrewsbury A and wins against River View and Oldfields B. They met Oldfields A in the semi-final. After conceding their first goal of the tournament, the team equalised with a goal from Bradley. 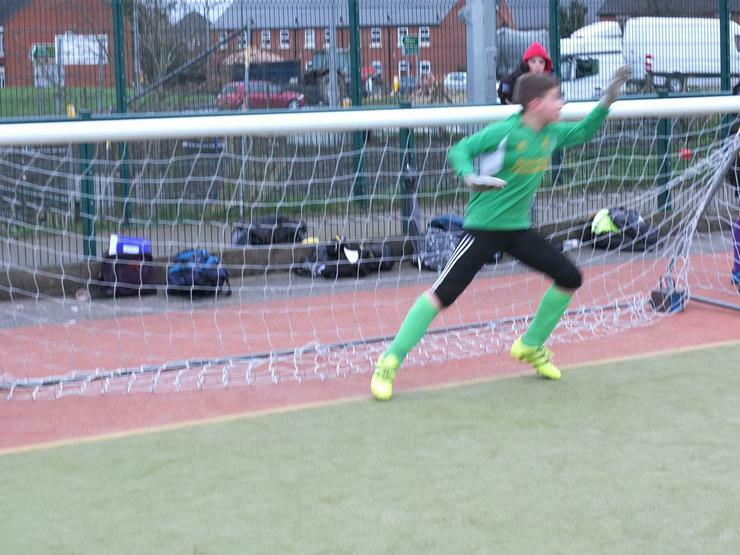 Edge Hill A had other chances too, but a good goalkeeper kept the team from scoring the winner. With the scores still level after a short period of extra time, the match went to a penalty shoot-out. It took 8 penalties before the deadlock was broken but, unfortunately, it was Oldfields who got the winner. Although sadly knocked out of the competition, the team remained undefeated in normal play and should hold their heads up high! Edge Hill A: Flynn, Ethan G, Oliver, Evan, Dylan, Kacper, Ethan I, Cole and Bradley! Edge Hill B: Spencer, Phoebe, Jack, George, Lewis, Alfie, Danny, Will and Isaiah! 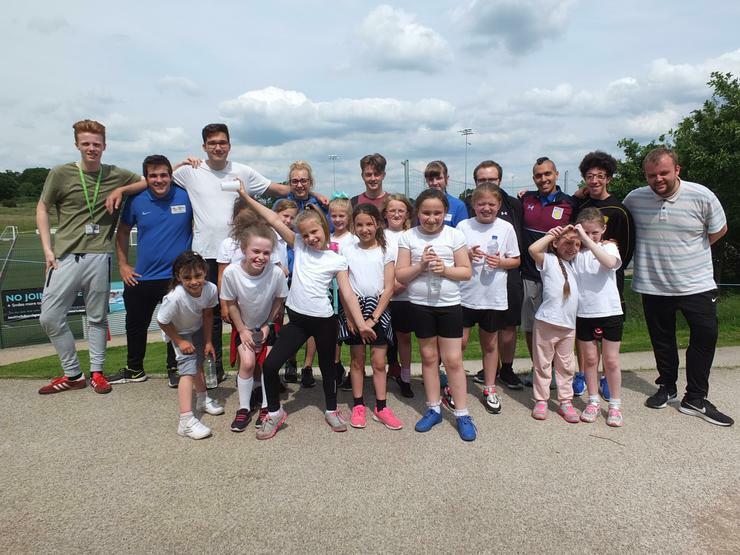 Our annual team sports day took place today, where the children competed in their houses and demonstrated their skills in a range of activities such as netball shooting, archery, hockey dribbling and catching. Each year group took turns to carousel through eight activities and amass as many points as they could. Also, bonus points were gained for teamwork and cooperation. Without a doubt, everyone had a great time and hopefully learned some new skills along the way! 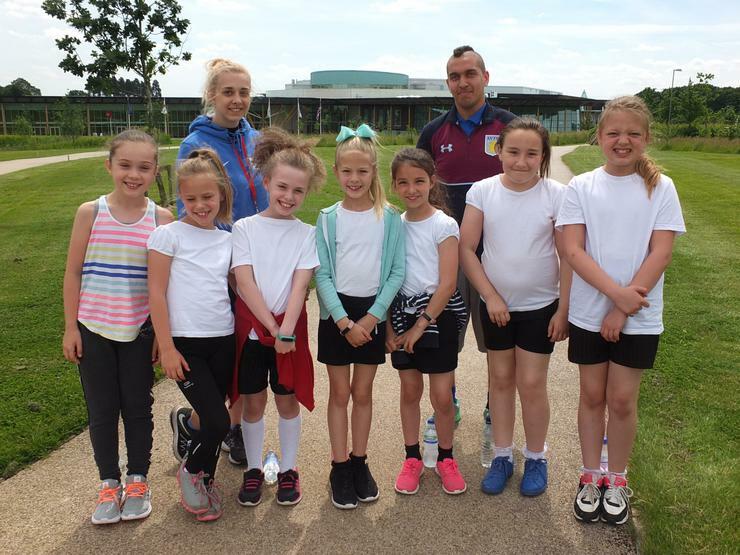 The Edge Hill Fives and Sixes teams travelled across the town to Outwoods Primary School for their first away fixtures of the season. Edge Hill Fives played Outwoods first and went ahead after a great goal from Phoebe! However, Outwoods pressed the team hard and drew level. Jack was excellent in defence, disrupting attacks and shepherding players to the sidelines. Despite some breaks which nearly resulted in the team taking the lead again, Outwoods got a second goal. Unfortunately, that was how the game ended. Despite the loss, the Fives should not be dispirited as they put in a fine display against one of the stronger teams in the Burton area! Well done Fives! The Sixes began their match against Outwoods with some great passing which nearly resulted in a goal soon after the kick-off. The team always looked like they were capable of scoring, but it was Outwoods who got the first goal. 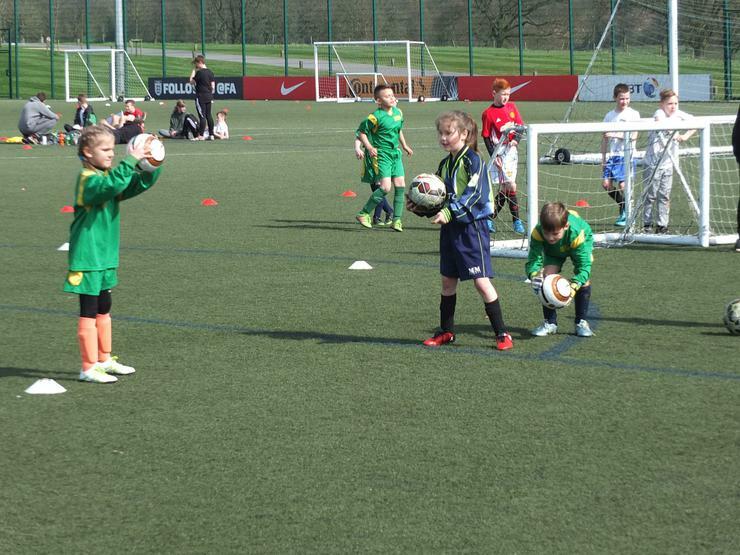 Not long after, Flynn scrambled a ball into the net after some desperate defending by the opposition defence! However, once more Outwoods scored again to make it 2-1. 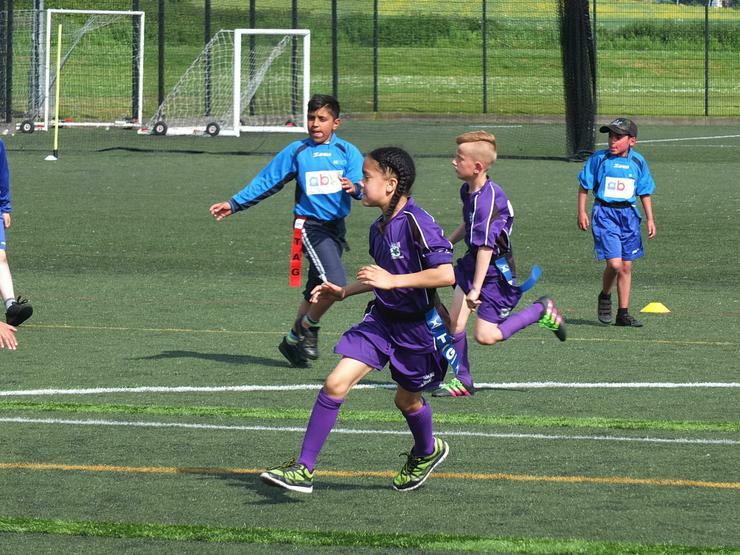 In the second half, Ethan G got an equaliser for the Sixes and the team started to assert themselves – especially in attack! With Bradley playing a forward role, the chances started coming thick and fast, and it wasn’t long before Ethan got another goal to put us in the lead for the first time in the match. The team now had the bit between their teeth and sensed that they were on top. 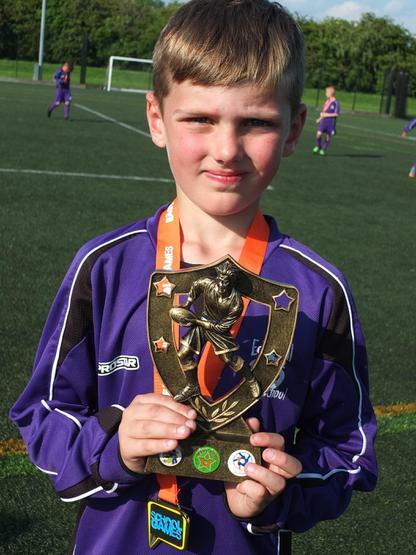 By the time the final whistle was blown, a goal from Bradley and two more from Ethan had stretched the lead to 6-2! Some fine forward play and cool finishing was the difference between the two teams. 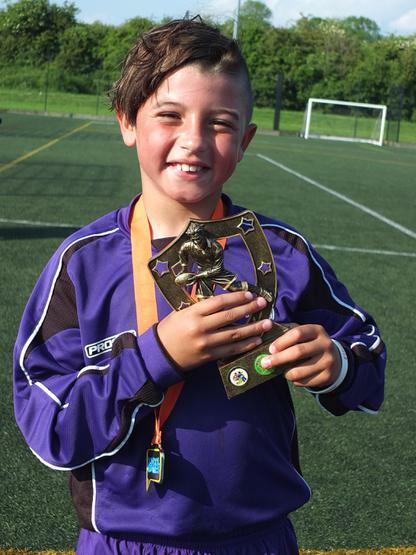 Ethan played a blinder and deserves the Man of the Match award! Well done Sixes for getting another win! Edge Hill Fives: Spencer, Phoebe, Jack, George, Lewis, Alfie, Danny, Will and Isaiah! Edge Hill Sixes: Flynn, Ethan G, Oliver, Evan, Dylan, Kacper, Cole and Bradley! Both of our teams had a great start to the new season today by winning their first league matches. Edge Hill Fives faced River View first and put in a solid performance by scoring 3 times. Phoebe got the opener, followed by 2 goals from Spencer. However, they didn’t have it all their own way with River View making it an exciting game. George was impressive in midfield, getting the ball forward on many occasions. 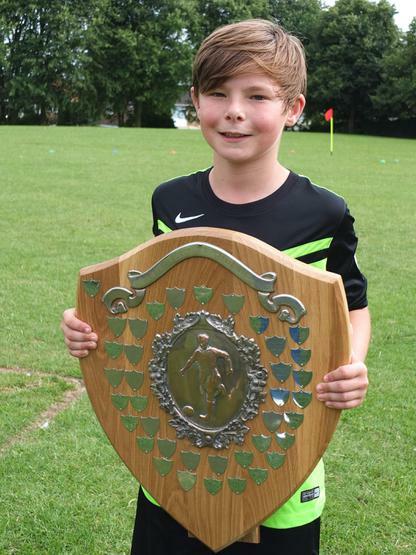 Another stand out performance was put in by Alfie, who impressed with his energy and shooting. Well done team! Apart from Evan in goal, the remainder of the Edge Hill Sixes team was made up of players who competed in the league last year. Ethan G opened the scoring followed by a goal from Flynn. 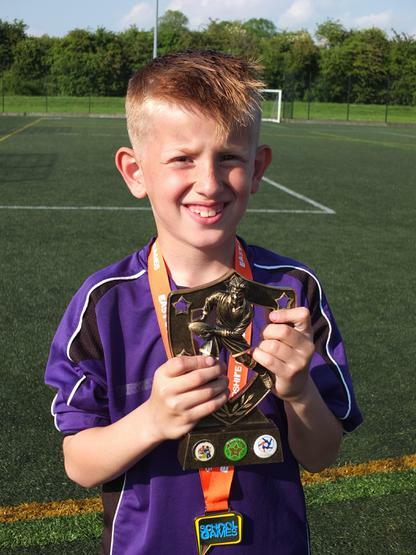 The third and best goal was an unstoppable rocket shot from Dylan from the half-way line after the ball had been cleared from the opposition defence! Flynn got the 4th goal, securing the win for the team. Well done to both teams for making it a double winning start to the league programme! Edge Hill Sixes: Flynn, Ethan G, Oliver, Evan, Dylan, Kacper, Ethan I and Bradley! For most of our Y3 and Y4 footballers this was their first time representing the school. 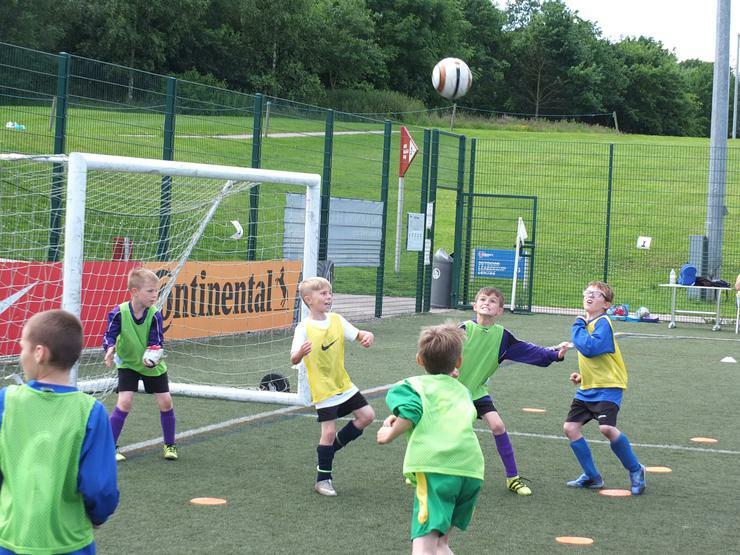 In fact, the majority of the players were from Y3 and had only been at the school for a week or so! However, our players did magnificently and both teams progressed through the group stages to reach the finals! 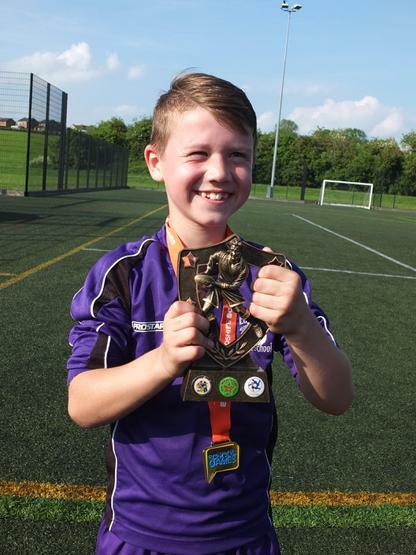 After a shaky start against a good William Shrewsbury A team, Edge Hill B won their next two games, with a hat-trick from Cole in one of them, and went through to the semis as group runners-up! In the other group, Edge Hill A stayed unbeaten, notching up two draws and two wins, followed by a penalty shoot-out to separate the group winners and runners-up. Fortunately, all 4 penalty takers had their shooting boots on and won the shoot-out against Abbotsholme and progressed to the semi-finals as group winners! This meant that Edge Hill A would meet Edge Hill B in one of the semis! The semi-final was a hard fought game, but the excellent teamwork of Edge Hill B gained them a 2-0 win and a place in the final! In the final, Edge Hill B faced William Shrewsbury A, who had beaten them in the opening group game. However, the team had won all their games since that first match and showed how much they had progressed by quickly going 2-0 up! The opposition pressed them hard and did manage to get a goal back, but the team dug in and kept them from scoring again. When the final whistle was blown, Edge Hill B were the winners! Hooray!! As an added consolation, Edge Hill A won the play-off for 3rd place. Edge Hill A: Omarion, Jack S, Brooklyn, Harrison, Zack, Jack S and Kian! Edge Hill B: Jack Sh, Sam, Charlie P, Max, Charlie F, Leo, Cole and Lily!